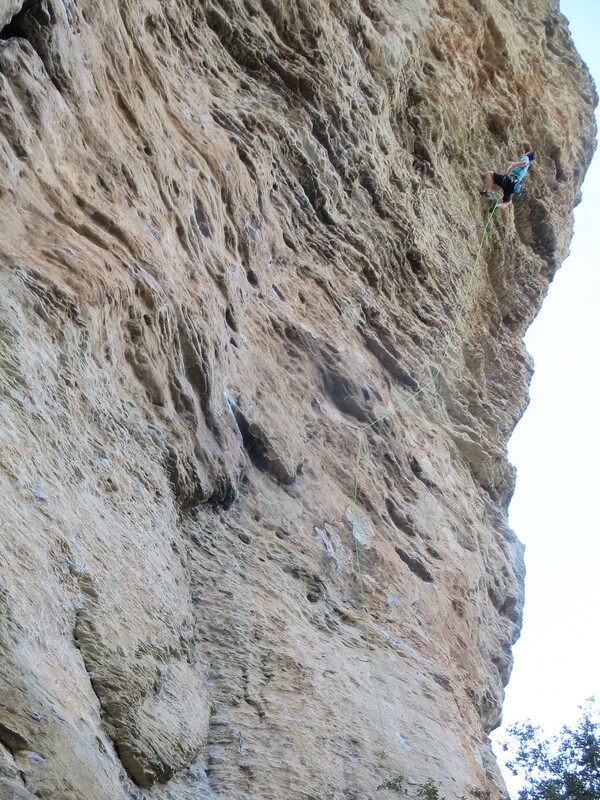 Technical edging low on the “Brown Scoop Wall.” Photo Mike Anderson. 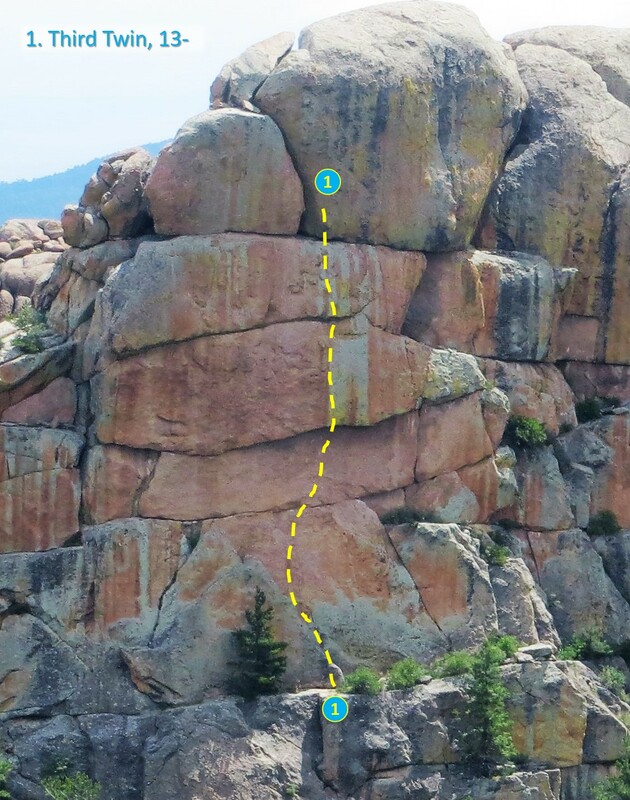 Once I finished up the Switchblade projects, the next objective on my list was a massive fin of granite called “Sidewalk in the Sky.” This formation is about 100 meters wide, and rises a good 70 meters from the ground. It peters at the summit to a narrow strip of dizzying granite, hence the crag’s name. The wall is slightly concave, such that the lower pitches are steep slabs, the middle bands of stone tend to be vertical, and the upper reaches are slightly overhanging. 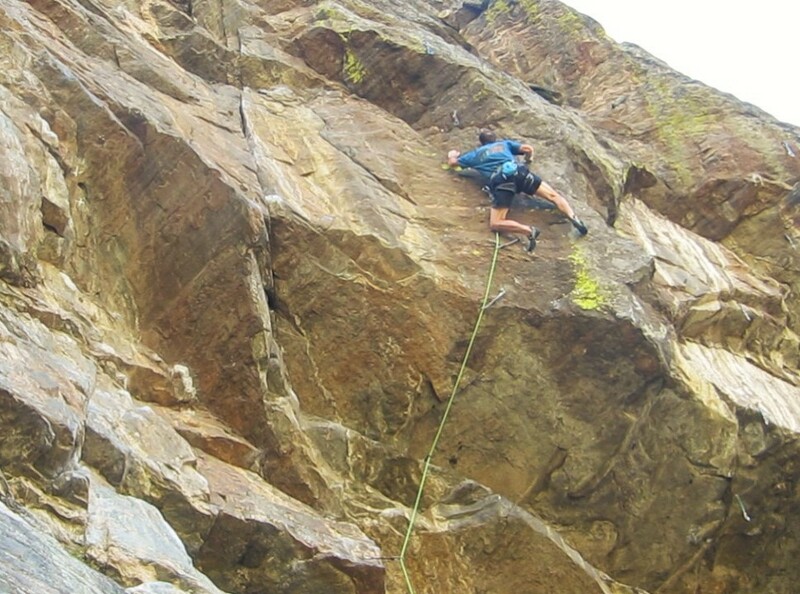 While there are a number of multi-pitch lines on the cliff, the wall is split at the waist by a massive ledge system that makes accessing the upper “pitches” much more convenient. The impressive west face of Sidewalk in the Sky. I first visited The Sidewalk with Tod Anderson in May to try a project he had started on the far left end of the wall. We finished equipping the line and sent it a few days later. Third Twin is basically a super-steep slab of tiny edges and divots to an 18”-deep roof. 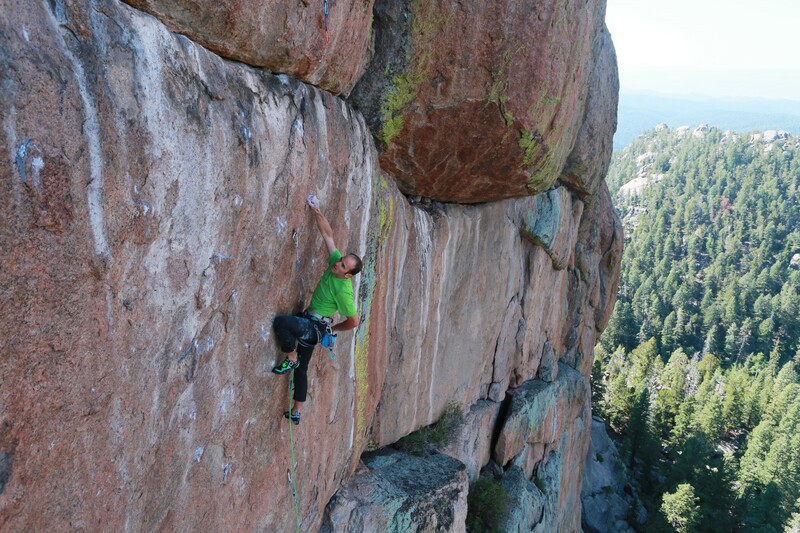 The slab is composed of impeccable cream granite, hands-down the best I’ve seen in Colorado. The business is oozing up this slab—great training for El Cap free-climbing. There’s a hard slap pulling the roof, followed by a few bolts of sustained patina edging before the difficulty eases. Tod nearing the slab crux of Third Twin. With Third Twin in the bag, I turned my attention to a stunning panel of stone in the center of the Sidewalk, which I informally & un-creatively dubbed the “Brown Scoop Wall.” This impressive swath of stone is covered in dark-molasses patina, and steepens ever-so-slightly with height, yielding a swelling wave of rock that curls over at the lip on the right-hand side. I prepped a trio of lines on this feature and set to work unlocking the moves. All three lines are excellent and compelling in their own way. 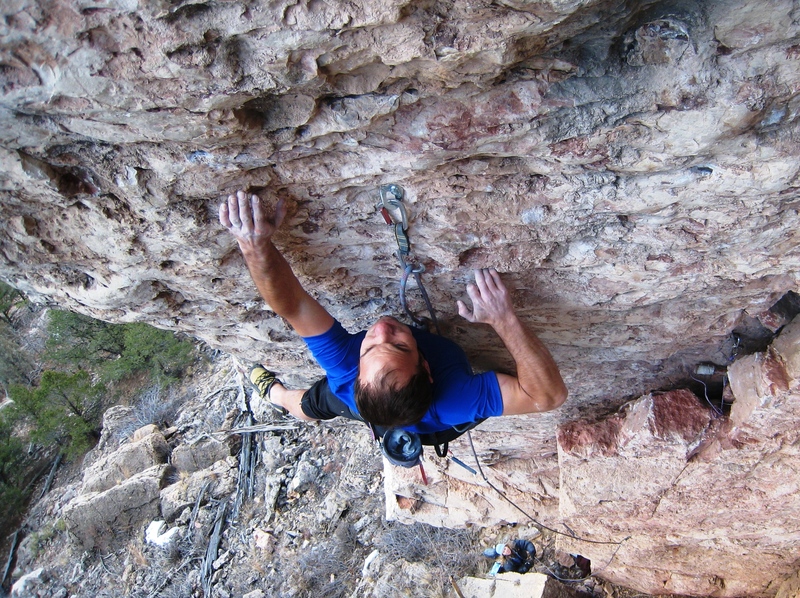 The left-most line, Groposphere, has the best rock and most consistently difficult climbing, offering three distinct crux sections split by no-hands stances. 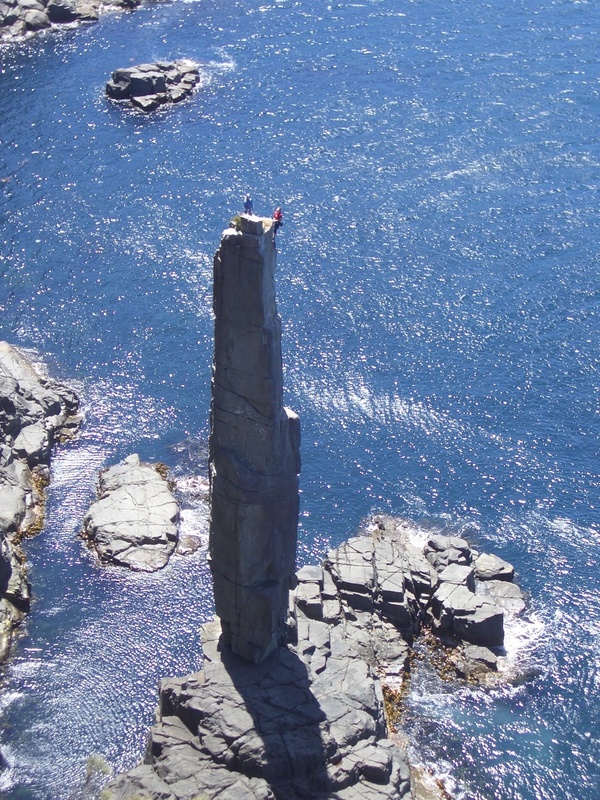 The difficulties begin with balance-y, technical climbing up an unusual swath of water-polished granite. The next and hardest section involves a burly, dynamic roof pull, followed by sustained, sequential edging up a subtle pillar. The final panel hosts a pumpy dash through gently overhanging patina. Groposphere, groping through the crux. The central line is the most consistently difficult of the three. It begins easily, but is more sustained in the upper third, with two hard extended boulder problems split by an active rest. The climbing through the penultimate panel is technical and insecure, with big reaches to sharp edges and tenuous footholds. The final band hosts a powerful, precise, and dynamic crux, followed by many sustained moves of pumpy climbing on bomber patina. Both these lines are in the 13+/14- range. The final crux of Groposphere. Unquestionably the best of the three is the right-most line, an awesome directissima that climbs right up the steepest part of the wall to the lip of the cresting wave. The climbing becomes steadily more difficult with each inch of progress, culminating in an improbable, soaring throw to the lip of the scoop. Thin edging on the right-most of the trio. Photo Mike Anderson. I figured the latter would be the hardest, but I vastly underestimated just how hard it would be. The “approach” came together quickly, but the final move was not only improbable, but incredibly difficult and finicky. 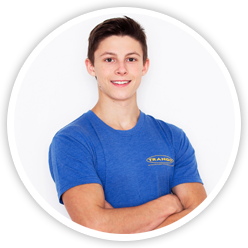 It’s a move that demands 100% belief at the outset, followed by impeccable execution of all four limbs, hips and core. If you move flawlessly, the conditions are good, and your skin is thick, you have a chance, but only if you give maximum effort and attention to latching the target hold. Attempting the burly throw that caps off the wall. Photo Mike Anderson. It took several weeks of frustrating failures to perfect my timing. By the end of the process, the move was essentially trivial from a hang, but my confidence was severely eroded by repetitive failure. Then on my 7th day of redpoint attempts it finally happened—negative progress. For the first time in several days I failed to reach the dyno on redpoint. 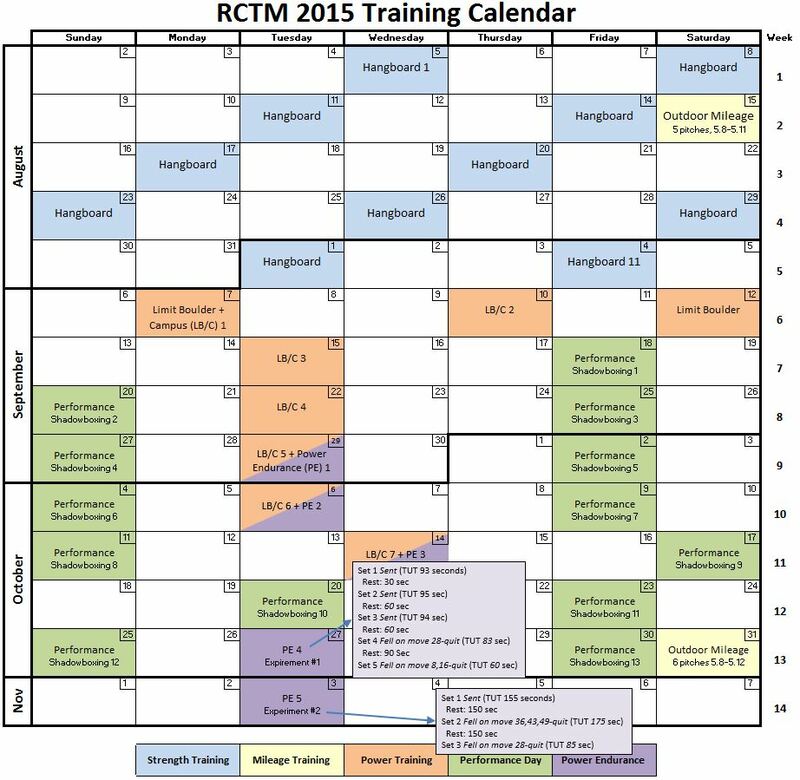 Up to that point I had plowed through each monotonous rest day by agonizing over every speck of beta, every finger placement and hip shift, in hopes of optimizing my chances for the next climbing day, when I would get two or three opportunities to stick the move and slay this beast. But on the 7th day I got zero chances. That was devastating. The next climbing day was not particularly cool, but there was a persistent breeze and the rock felt (I hate this word, but…) tacky. The approach was easy, but that wasn’t surprising. I arrived at the dyno feeling good, nearly completely fresh, something I had experienced several times. But this time I made a point to hesitate. I stared down the hold, took a couple breathes, and thought about what I needed to do with each hand and foot. I coiled and slapped. Latching the throw. Photo Mike Anderson. I latched the hold and wiggled my fingers into the sweet spot. I matched the jug just over the lip, shook out for a few seconds and chalked up before cranking out the mantel onto the slab. Walk Tall Or Not At All combines outstanding rock, position and movement. I reckon it’s at least hard-14b, or possibly light-14c. Considering together the quality of the finished product and effort required, I can’t think of another first ascent I’m more proud of. Rocking over the lip. Photo Mike Anderson. The juxtaposition of my life does not go unnoticed by my closest friends and family. On one hand I love order, control, routine. Type A personality stuff. On the other hand, the well-defined and fully explored bores me to death and I crave adventure, the unknown, something new and ever-changing where the outcome is uncertain. While those seem to be at great odds with each other, they come together in perfect harmony for me in the form of calculated risk. It’s the best of both worlds really. Let me give you a few examples. 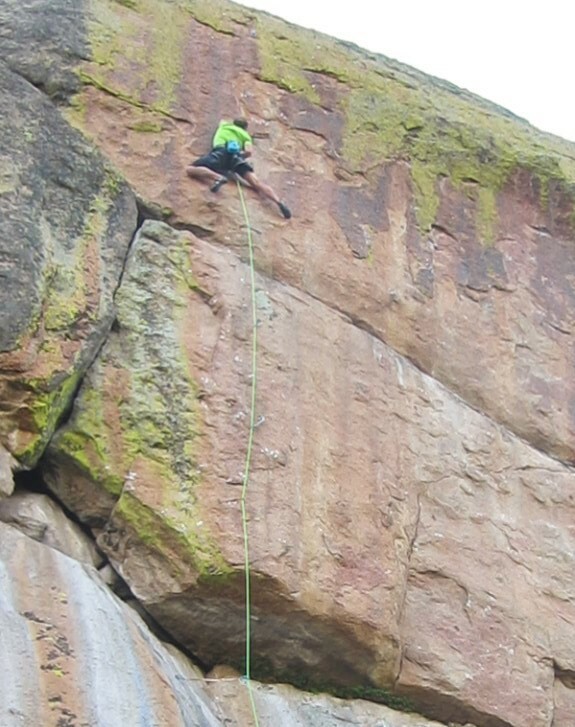 Before children, I free soloed and did X-rated routes up to 5.12. I can’t actually think of a single case when the route wasn’t an onsight. It had adventure, the terrain was unknown (to me) and the route was new (again, to me). 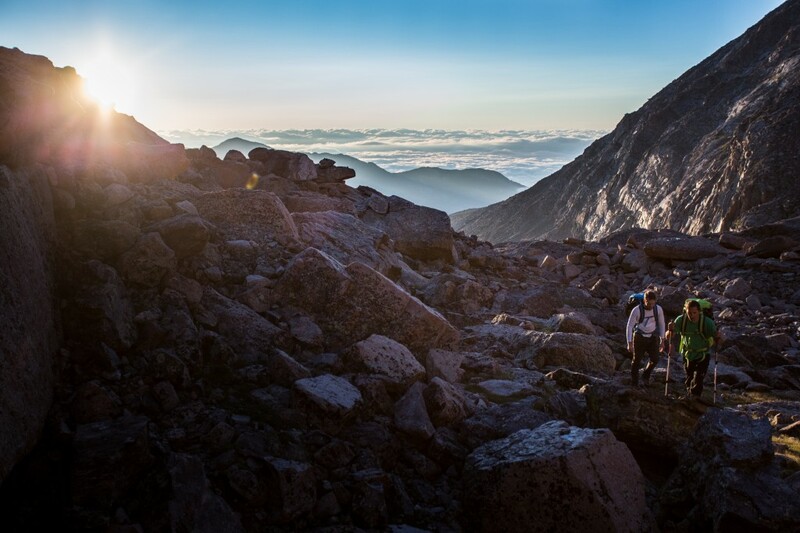 But anyone who has done much of that kind of climbing also knows if it’s too adventurous, too unknown, and the outcome is too uncertain, well then, you can’t do it for very long and live to tell about it. 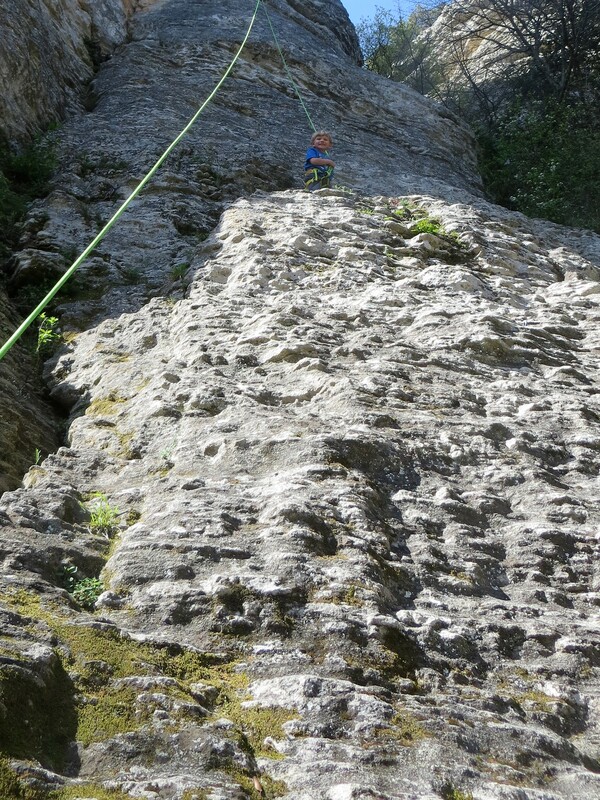 Free soloing for me was equally about control and order. I was intimately familiar with the rock type and the climbing area. I felt, tested, and retested every hold before committing. I never climbed up something I couldn’t climb down. In fact I’ve backed off 5.7s as many times as I’ve backed off 5.11s. Yes there was risk. Yes I could have fallen. But those odds were slim. They were calculated risks. Here’s another example. I received my Master’s degree in Special Education and found a knack for working with students with emotional disabilities in impoverished neighborhoods (the “ghetto” to you layman folk). Real-deal gangbangers with rap sheets and weapons charges that were known for violence. Most had given up on them so in turn, these types of students were quick to dismiss others (often violently). Calculated risk. I had the educational training – the strategies to diffuse the situation. I also have the personality to relate to them on their level, gain their trust, and push them toward a more positive direction. But it’s not without challenges and sometimes real dangers. 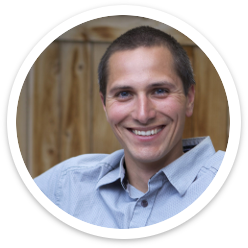 I’ve had students get extremely angry – try to punch me, throw chairs at me, and worse. But I had the tools and mindset to get out of those situations (mostly) unscathed. The flip side is that teaching in a public school offers security and routine on some levels, yet every day was different. What worked with a kid yesterday won’t work with that same kid tomorrow. You must always adapt, constantly learn and improve. It kept me on my toes and was a good balance for me for a long time. Fast forward and here I am, smack-dab in the middle of my thirties. 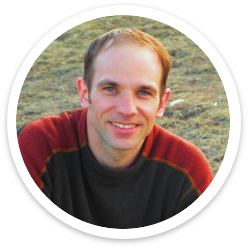 I crave a change – a massive life shake up. Perhaps just ahead of the curve on a mid-life crisis. My mom always said I was advanced for my age. Anyway, teaching has given me so much and I hope that in return I have given something back to the kids I’ve worked with over the last 12 years. But it is too routine now, too “safe”, too familiar. My adult obligation of financial security I owe my family pulls me in one direction while the desire to take a risk and choose a new career path pulls me in another. I could not find balance between the two. But I’m not a risk taker. While what I wrote above would seem to contradict that to some – what I mean is I’m not an “unknown outcome” kind of risk taker. Imagine this scenario for a minute: You flip a coin. Heads I win a dollar, tails you win a dollar. I do not see it as a 50/50 chance of winning a dollar. I see it as me losing a dollar. The odds are too unfavorable – there is too much risk. I would never agree to flip the coin. The risk must be low. I’ve built too much of a life to gamble any of it. Yet to some degree, there needs to be a little risk to entice me. Where is the balance? It’s different for each of us and it’s taken me a long time to finally find it. 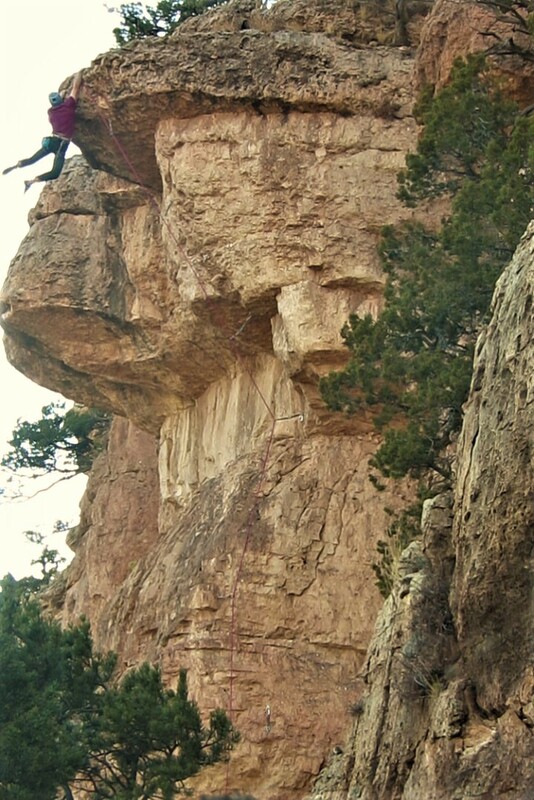 I’ve been a rock climber for more years of my life than not. 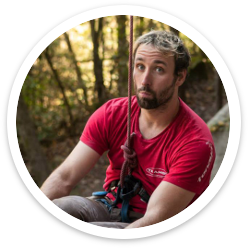 I’ve worked in gear shops, climbing gyms, for gear manufacturers, and even own a climbing publishing company called Fixed Pin. 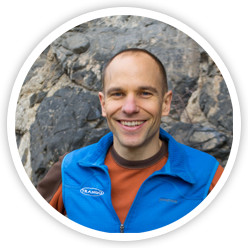 I have no formal education in “climbing business” but I know it better than anything else, perhaps better than I even know teaching. 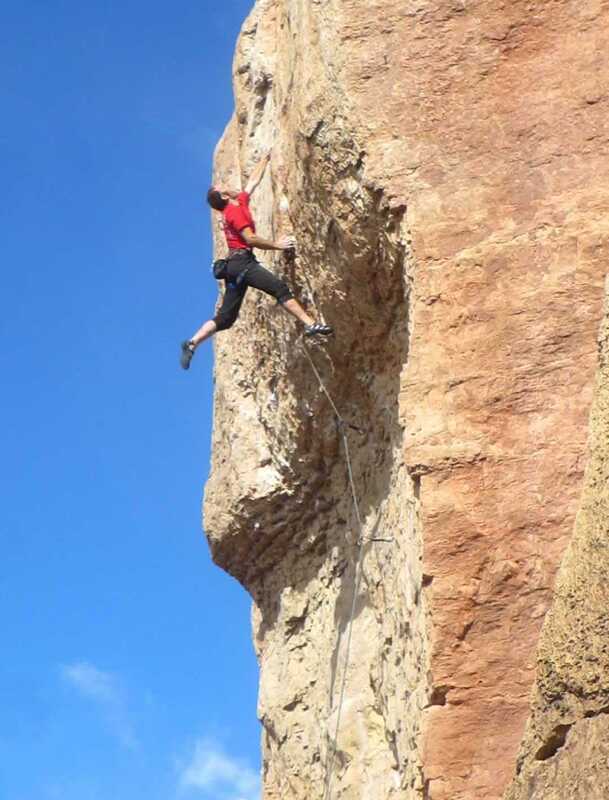 Climbing is my religion. I’m not a zealot but it is how I decompress, how I commune with nature, and how I rebalance myself. When I’m out of whack, my wife tells me to go climbing and I come home happier, more patient, and a better life partner and father overall. Some drink, some pray. I climb. 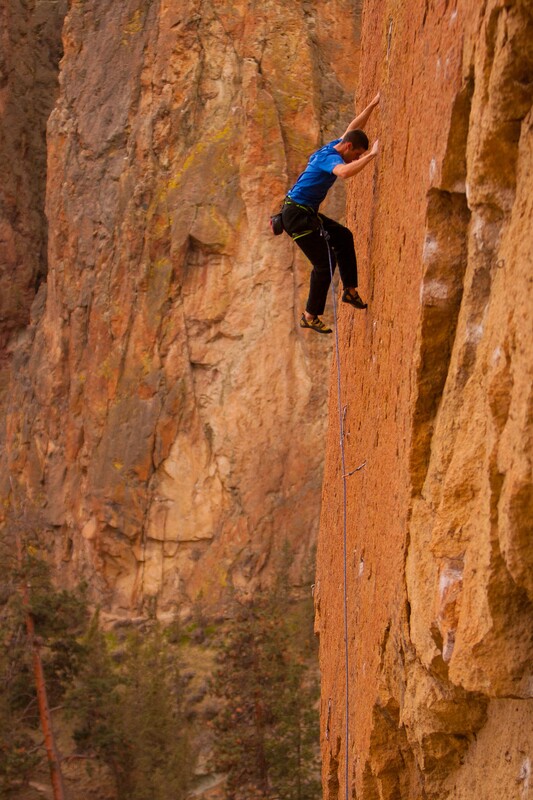 Climbing is all I want to be around. 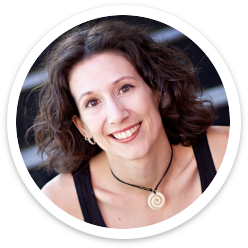 I want to talk about it, write about it, and well, just do it. 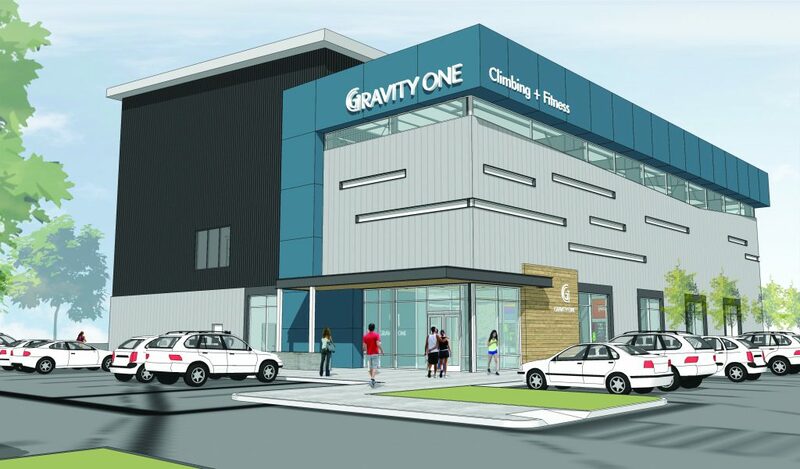 Enter Gravity One Climbing + Fitness. I had always thought starting a climbing gym would be incredible but it seemed a bit too unrealistic for me. They cost millions of dollars to start up after all. But I have found that, perhaps through happenstance, I have been building up to this moment my entire adult life. 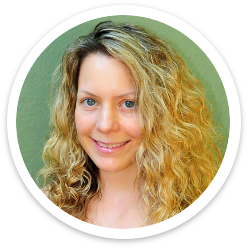 I have the right experience (work and personal), the right connections, the right motivation, and the right amount of risk tolerance to venture off into the unknown – quit my government job as a public-school teacher that I virtually could never be fired or downsized from and start my own business where I am my own boss. All decisions directly affect me, good and bad. I could win big or I could lose it all. But it’s calculated. And isn’t that what being a climber means? Taking calculated risks. Isn’t that the lesson we all experience every time we go out to the crags? We leave the safety of the ground, where yes, we could fall back down to it. But we have ropes and protection and a trusted belayer to catch us. 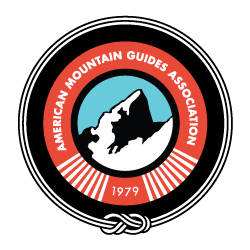 Things could go wrong – a piece could pull, a clip could be botched, a belayer could give too much slack. But rarely do we experience any of those things. We fall but only a little bit. We take comfort in both the risk itself as well as knowing that those risks have been greatly mitigated. 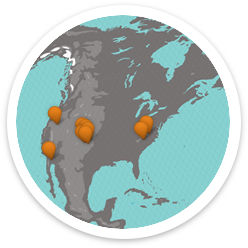 Our partner has us. Our rope and gear will catch us. We push ourselves sometimes to places that are uncomfortable but we revel in that feeling once back on the ground, sometimes hours, days, or even weeks later. We retell those events over beers and around campfires trying to recapture that feeling. To me, that’s what it means to be a climber. Leave yourself exposed just enough to feel uncomfortable but not be in danger. I just feel so fortunate that I’ve finally learned how to carry that over into my professional life and to be able to experience a feeling of balance of calculated risk outside of climbing itself. 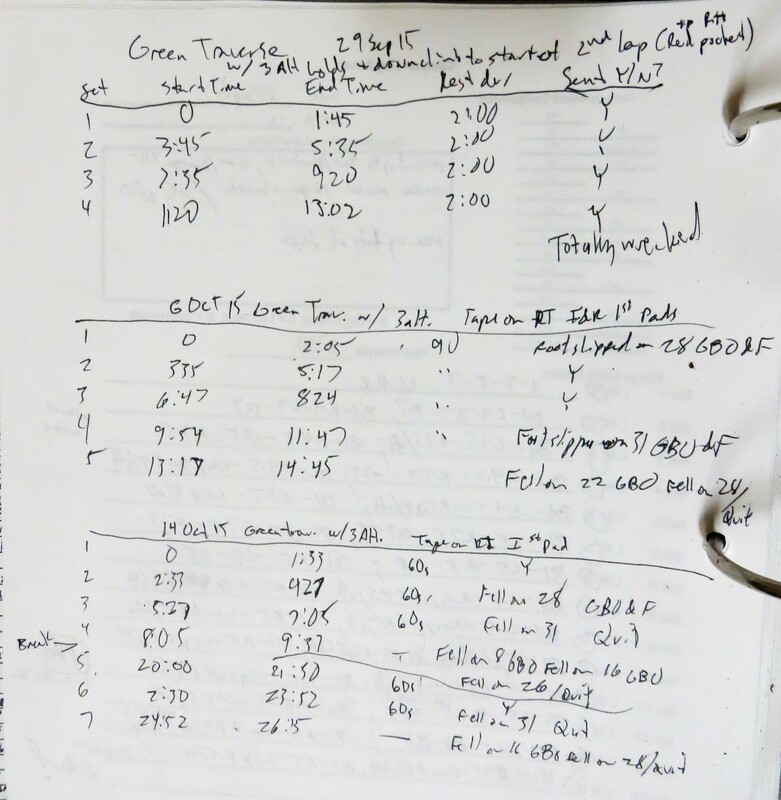 In 2015 I crossed paths with prolific route-developer Tod Anderson (no relation). 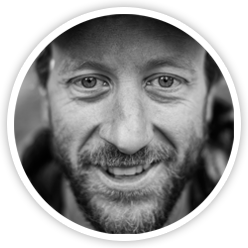 Tod has been a major player in Front Range route development for decades, but he is probably best known as the Devil’s Head crag patron—discovering countless crags, opening hundreds of routes, establishing positive relationships with land managers, replacing old hardware, and authoring multiple guidebooks. 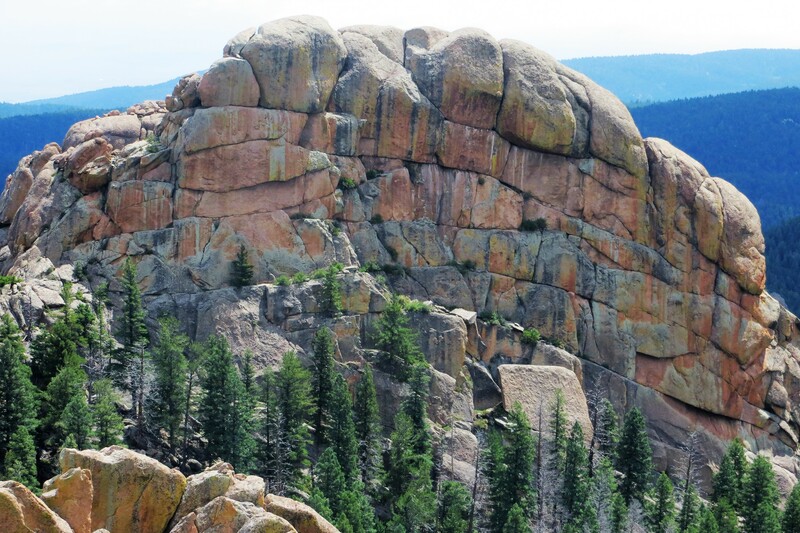 For those unfamiliar, Devil’s Head is a complex maze of heavily-featured granite formations about an hour outside of Denver, CO. It’s known for jutting knobs, chicken heads and incut patina plates. The scenery is stunning, with impressive views of the South Platte and Pike’s Peak. 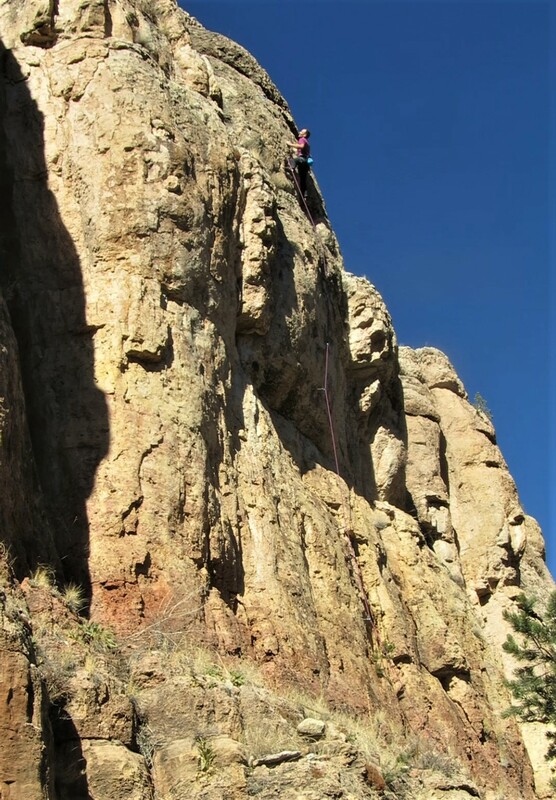 Furthermore, the crag’s high-altitude makes it the best venue for summer sport climbing along the Front Range. The labyrinthine spires and blades of Devil’s Head offer something for everyone. Photo Boer Zhao. 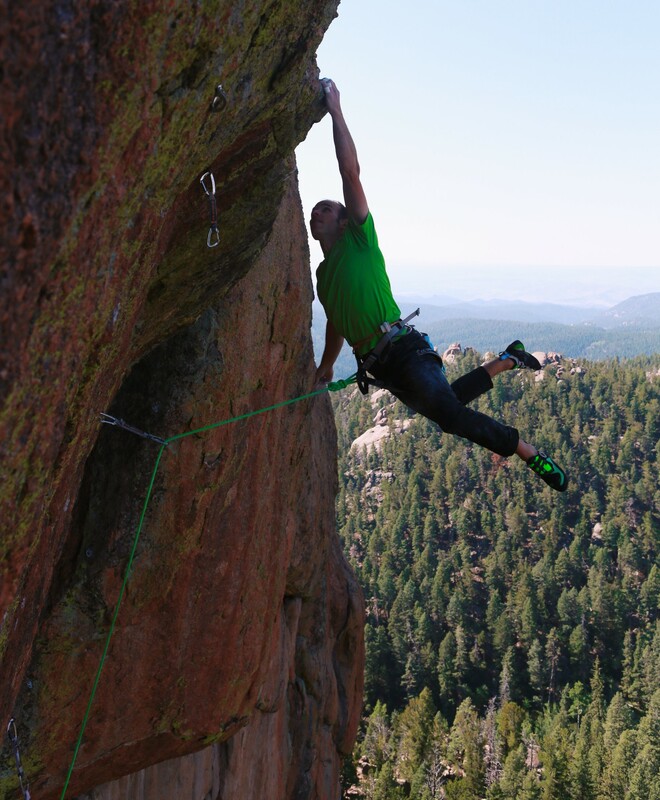 Thanks to the tireless work of guys like Tod, Derek Lawrence, Paul Heyliger, Richard Wright, and too many others to list here, Devil’s Head offers well-over a thousand excellent sport climbs and is certainly one of the best climbing destinations in Colorado. When we first met, Tod regaled me with tales of towering, slightly overhanging walls of crisp edges, just begging to be climbed. I soon discovered we shared a common passion for exploration, and we made vague plans to head up to the crag during the following summer. Unfortunately the Shadowboxing escapade prevented me from going in 2016, but this summer was wide open. 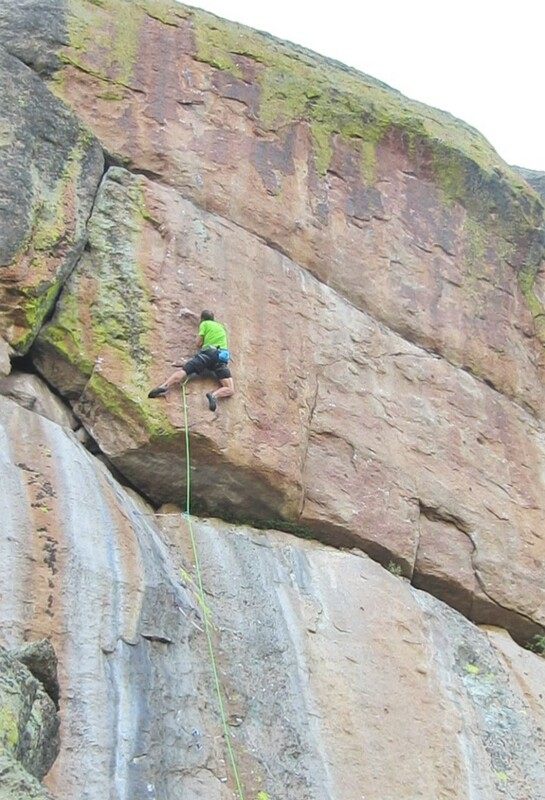 The first cliff Tod showed me is a jutting fin of granite called The Switchblade. The west face of this incredible formation is roughly 50 meters tall, overhanging about 5 degrees, and covered in small edges. This gob-smacking cliff already featured one world-class route, Blade Runner (5.13b), bolted by Tod and freed by his son Gordy back in 2013. 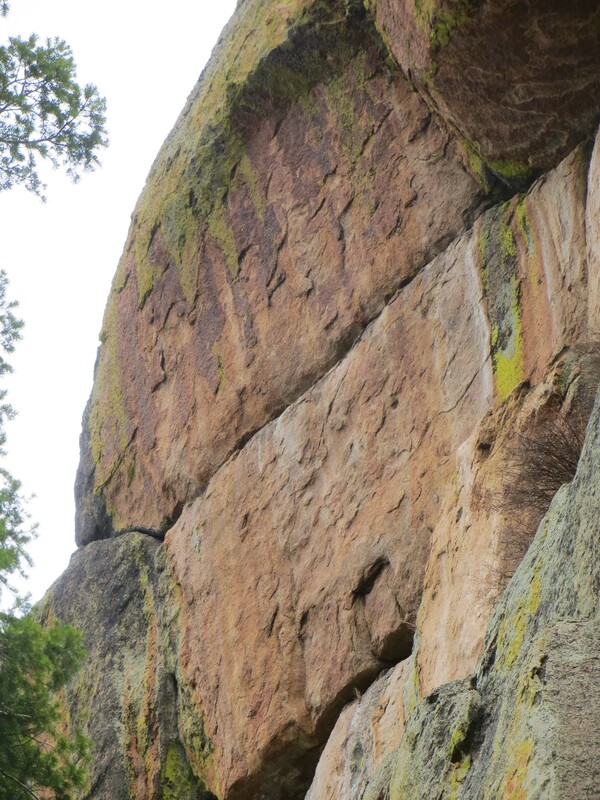 It’s easily one of the best 5.13s on the Front Range, though perhaps among its least well-known. 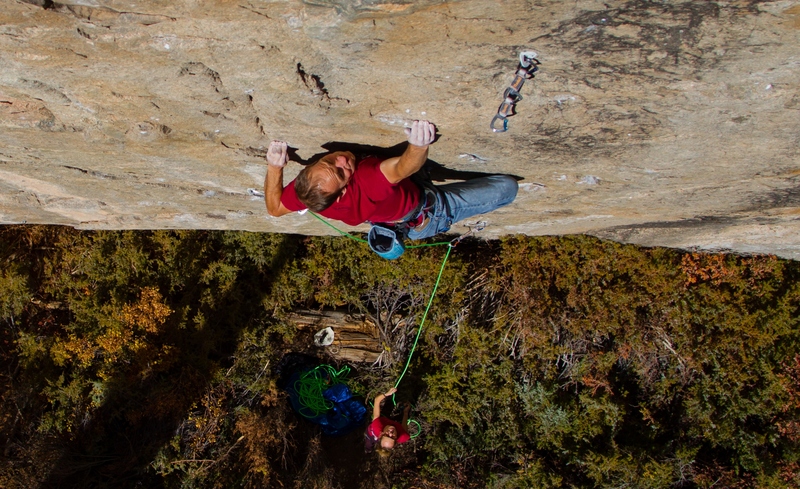 The Switchblade, with Tod Anderson on the classic Blade Runner, 5.13b. Photo Tod Anderson collection. There was still more potential on this cliff, so after a month on the hangboard I returned in late June to begin work on several Switchblade projects. 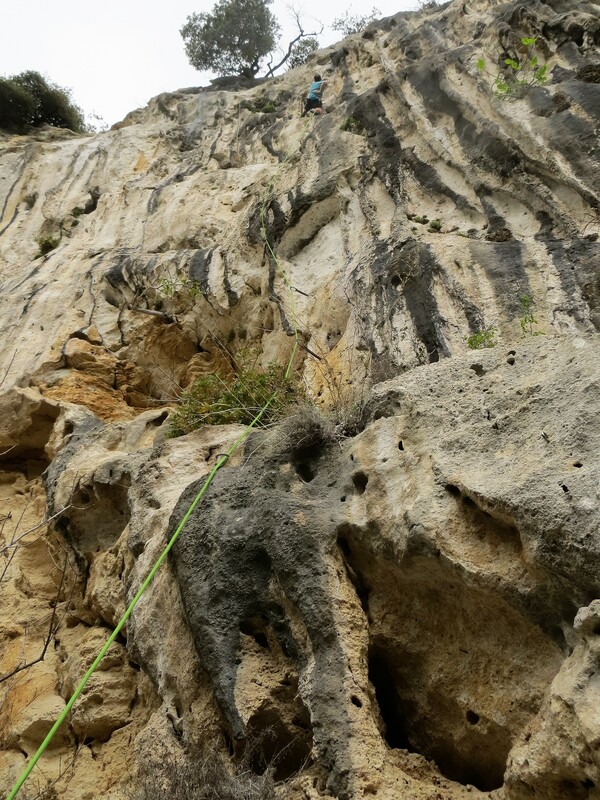 The main event is a 45-meter long line in the center of the west face (though due to some scrambling at the start, I reckon the business is “only” 30-meters). 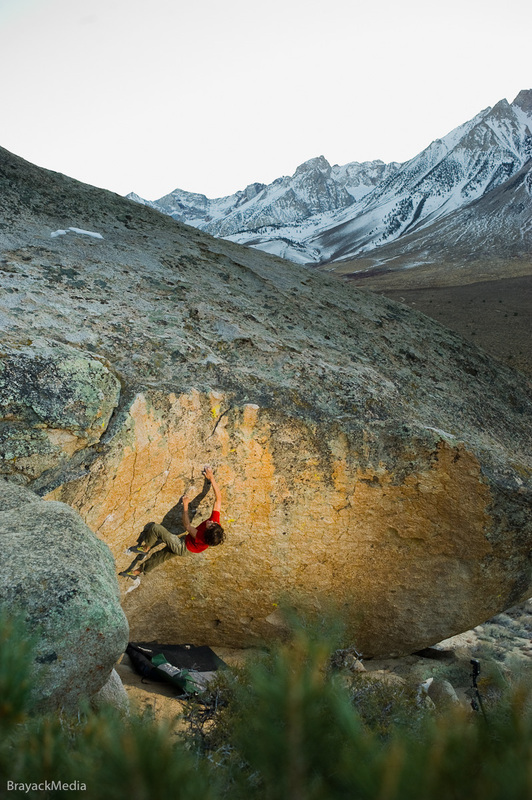 It starts with a short, slick slab crux to reach an awkward shake below a 4-foot-deep roof. 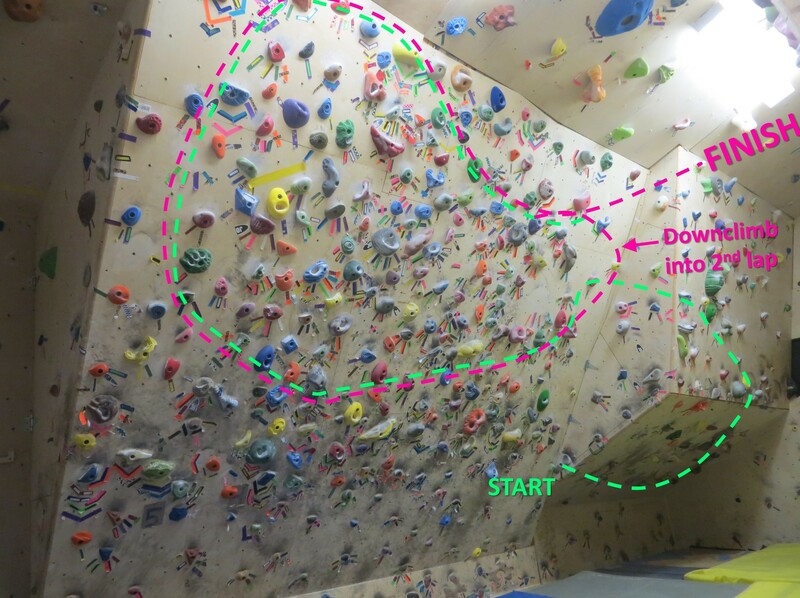 The roof is burly, with a couple campus moves on half-pad crimps (perhaps V9 or so? 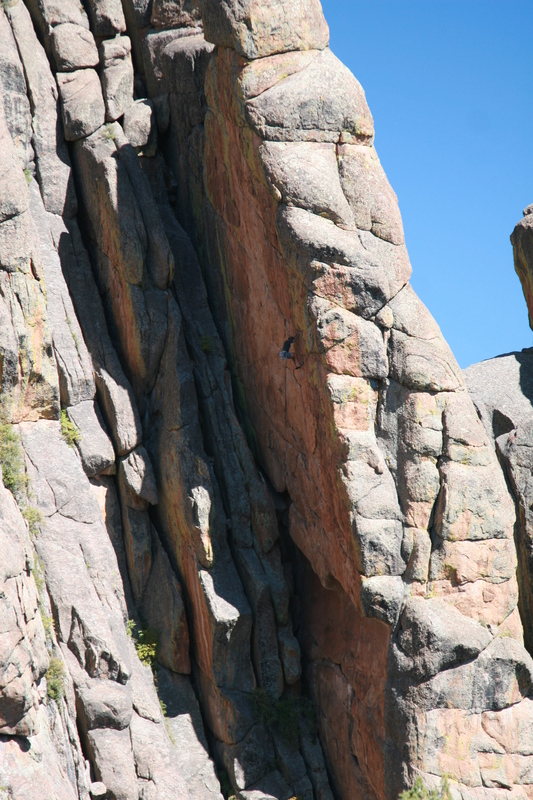 ), then the climbing eases for a couple bolts, including a great rest. 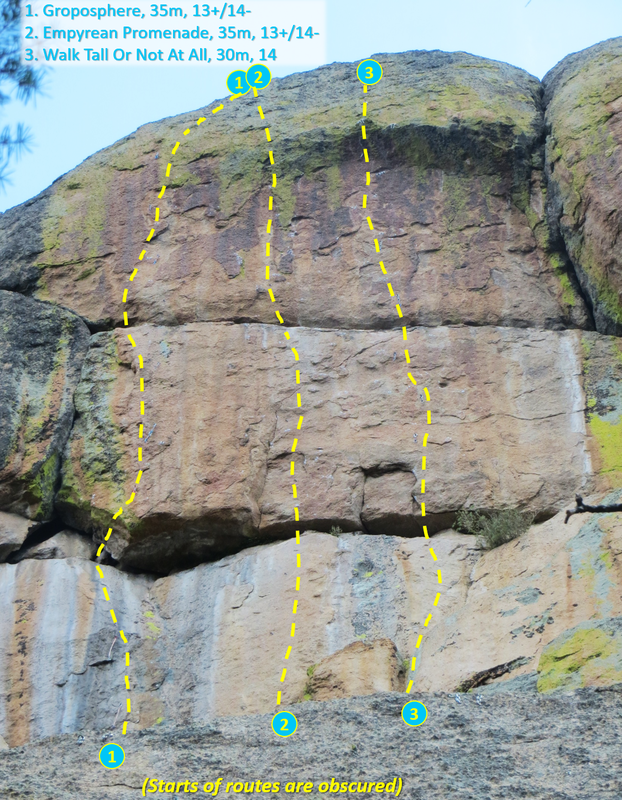 Next comes the redpoint crux—a 20-foot section of thin crimping. 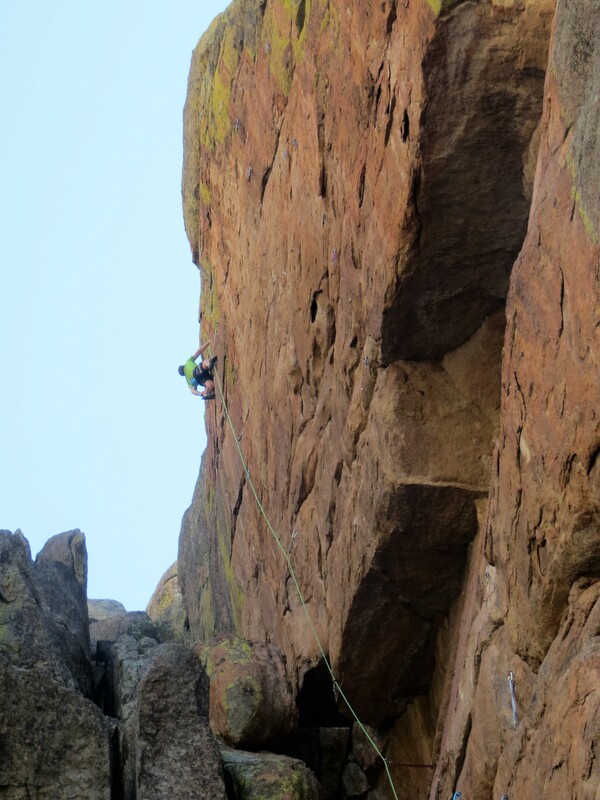 After that you have another 40-feet or so of technical, sustained 5.12 edging on phenomenal patina, split by a couple taxing rests, to reach the top of the wall. On day one I could tell this was going to be long and involved. In order to shake the rust off of my redpointing skills, I shifted focus to a potential linkup that would start through the roof of this route, but then veer right to finish on the upper third of Blade Runner. 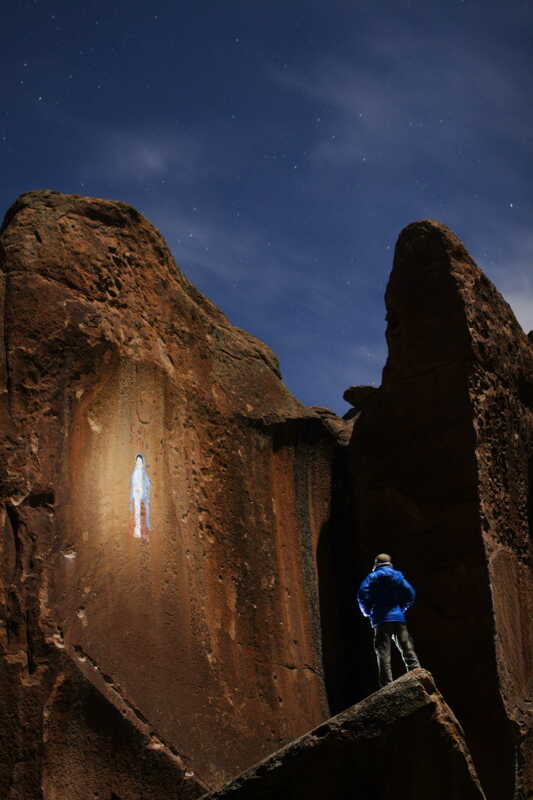 This line includes the aforementioned slab and roof cruxes, plus a reachy, thin crimping section moving past a cool hueco, and finally Blade Runner’s technical and shouldery upper crux. 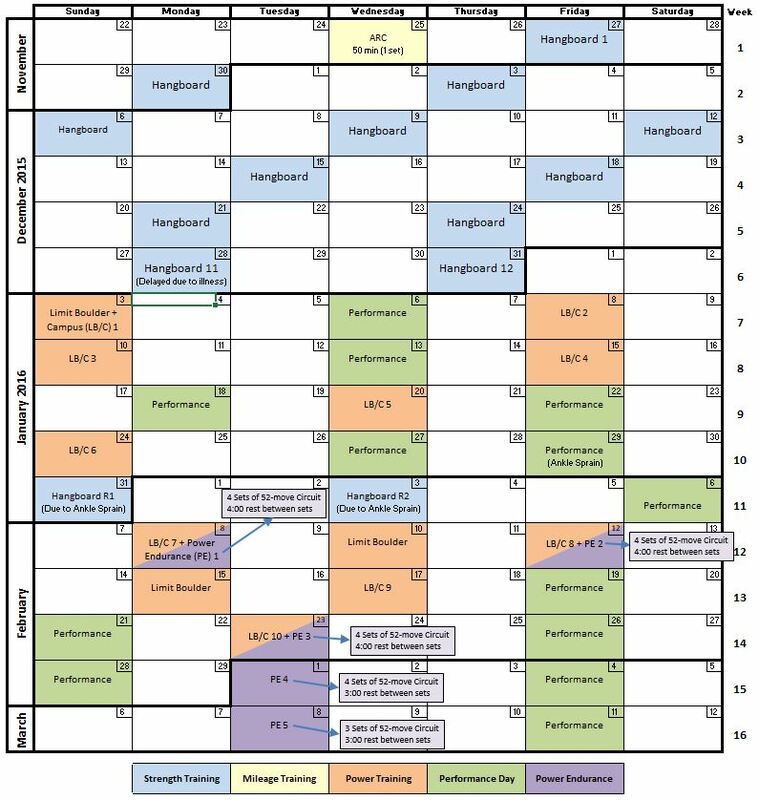 It is quite sustained and varied, but with some active rests along the way. It took me several days of work to link the committing roof sequence on redpoint, but once through this obstacle I found just enough rest along the upper wall to get through each crux and clip the anchor. I’d guess that Filleted Runner is about 14a, and certainly one of my better-quality FAs at that grade, with good rock, lots of climbing, continuous movement and outstanding position. Latching the V9-ish roof crank. Filleted Runner, 5.14a, continues straight up through the hueco above my head (at the very top of the frame), then veers right to join Blade Runner. With a good send under my belt, I returned my attention to the Switchblade’s central line. Within a few days I was repeatedly falling at the same move, an awkward slap to a thin, sharp crimp. 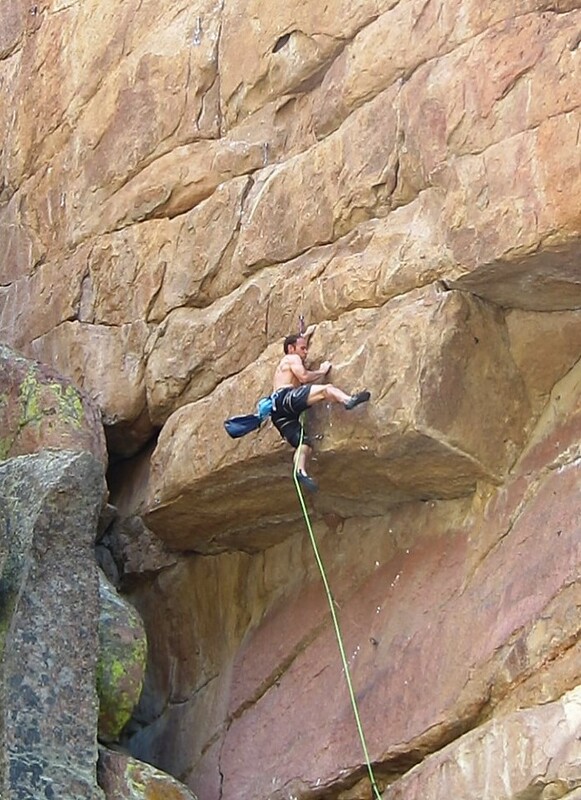 The lower sequences were becoming automatic, and I was consistently arriving at this crux feeling completely fresh, yet I still failed to latch this frustrating hold. On day 6, out of desperation I experimented with a different sequence that was higher-percentage but more powerful (essentially a burly, almost-static reach in place of a precise dynamic slap). I did the move several times in a row and felt this new option must be superior. Interestingly, I had tried this method my first couple days on the route, but was unable to pull it off for some reason. 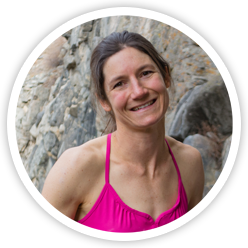 Perhaps at that point, so early in my climbing season, I lacked the recruitment and/or coordination to crank such a powerful move. Or, perhaps I was too timid (and my skin too tender from a month on plastic) to really bear down on the sharp holds in this section. Regardless, the lesson is pretty clear: it’s best not to be overly committed to your beta, especially if you’re stuck failing in one spot—continue to try different options throughout the process. For some reason I insist on learning the same lessons over and over again. As I headed up for the last attempt of the day I was feeling quite worked. 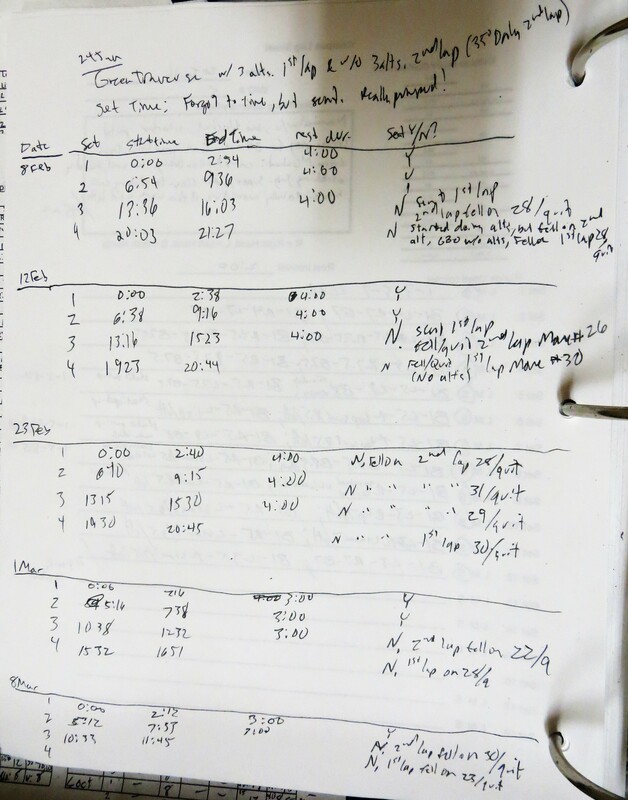 Typically I try to keep the first-go-of-the-day fairly light to save power for a second attempt, but on this day I burned a lot of skin and strength sussing and rehearsing the new sequence. The effort was worth it—I felt assured I would send soon with this new beta, but I didn’t have high hopes for this burn. Fortunately I knew the lower sections well-enough to sketch through in a state of fatigue. There are a couple of really good rests before the crux, so I took my time recovering completely and waiting for the wind to cool me down. 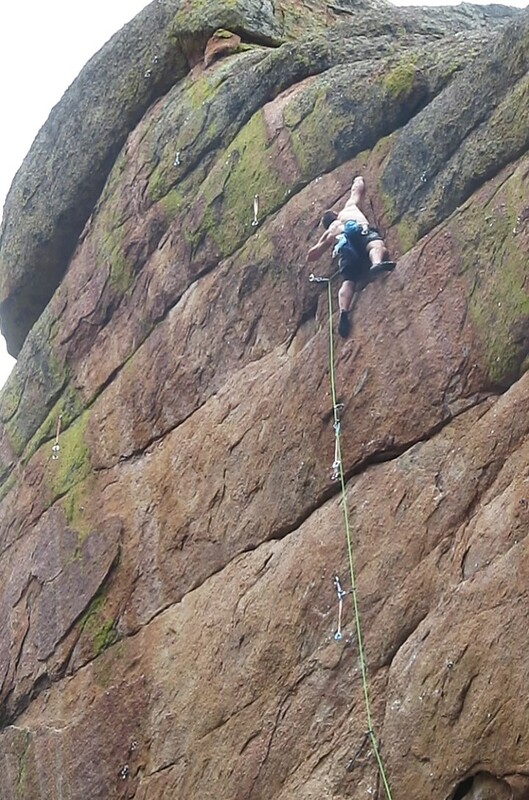 I nailed the crux edge with my new beta, and gritted my teeth through the next few crimps to reach a decent rest. As I cycled through the shake, my feet level with the Blade Runner anchor, I gazed up at the 30 ensuing feet of hard 5.12 edging, and numerous opportunities to fall. Why did I place the anchors so high?! My Smith Rock roots strike again. With patience all around, savoring the stellar patina and knobs that pepper the upper cliff, I worked my way steadily to the top. 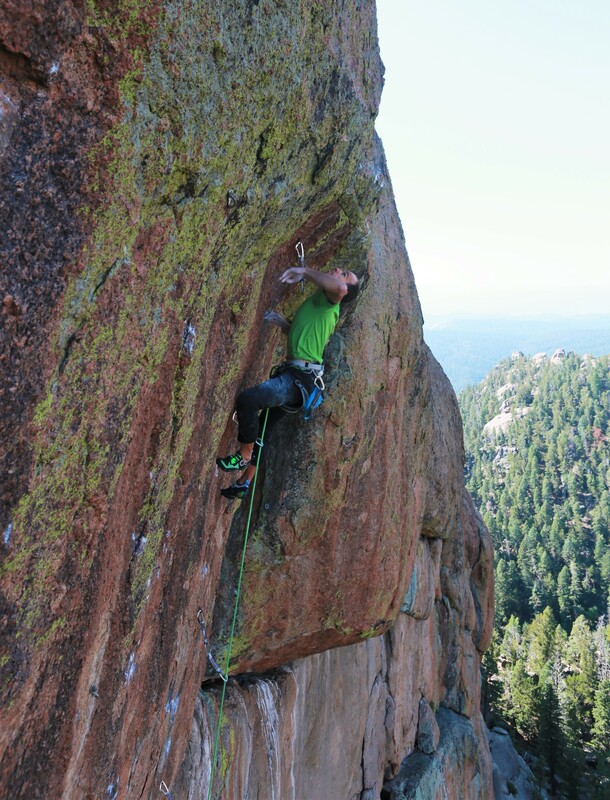 Above the crux of Stiletto, 5.14b, with another 30-feet of stellar crimping to go. I’m really proud of Stiletto. The movement is stellar, though there is a 2-bolt section of rotten rock above the roof. Fortunately the climbing is relatively easy through this section, and the rock is solid in the hard bits. If the rock were bomber throughout, this would be hands-down my best FA. Even with the bit of poor rock, I think it’s one of my best, considering its length, stature, continuity and movement. 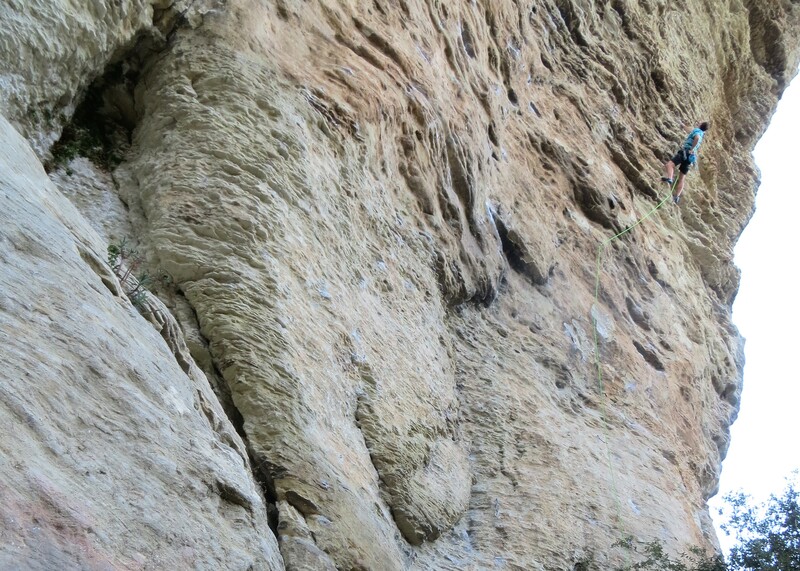 I wrapped up my Switchblade duel with a pair of hard 5.13 FA’s on either end of the wall. 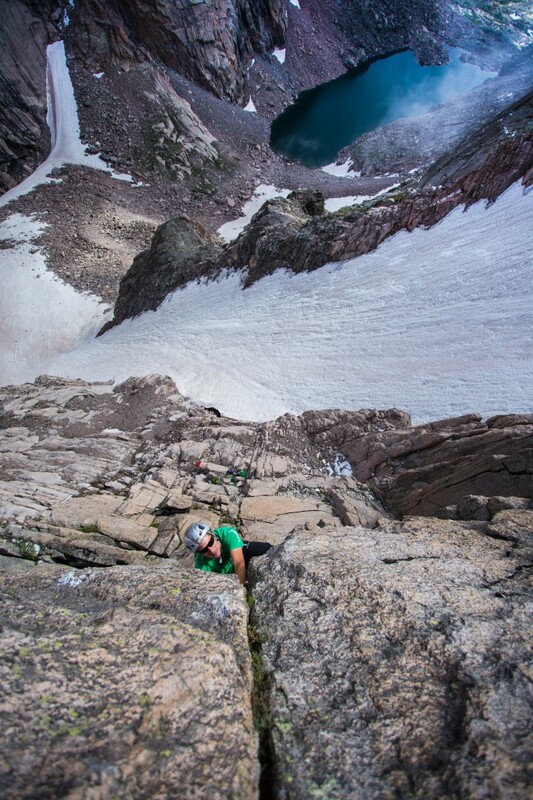 The far left line, Sliced & Diced, begins with a long stretch of tedious scrambling (due to its proximity to the adjacent fin of rock), but once you get on the west face of the Switchblade proper, the rock and climbing are incredible. The climbing involves some huge moves riding along the edges of massive, molasses patina plates. 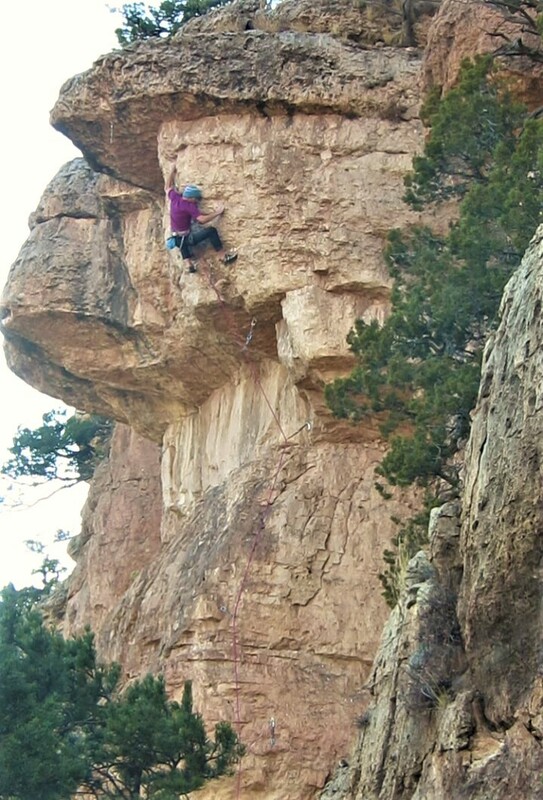 There are several cruxes, generally getting harder the higher you go, culminating in a technical thin crimping crux just below the anchor. Sliced & Diced, 5.13c, ascends stellar stone on the far left edge of the Switchblade. Photo Boer Zhao. On the far right end is David’s Bowie, beginning with some easier vertical climbing to another tough slab section to reach the same roof system as the others. 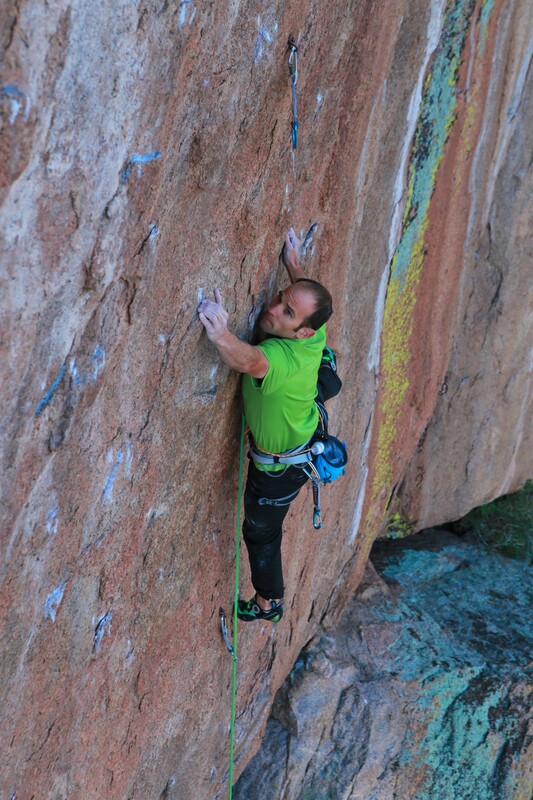 Reaching this ceiling is likely the crux, but huge jugs just over the lip take the sting out of pulling the lip. There’s still a tough, campus slap to get established over the lip, but it’s not nearly as hard as the Stilleto roof. 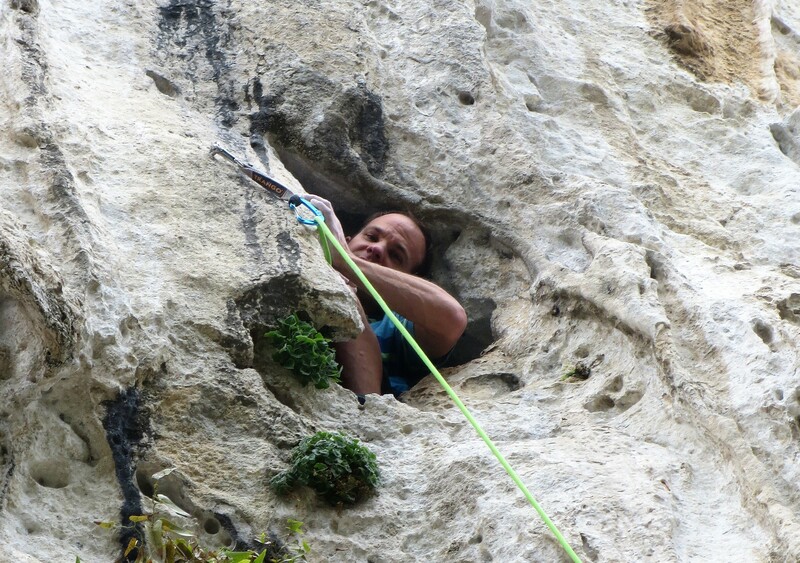 The route really shines in the final half, with fun, interesting 5.12 edging on great stone. While the rock on David’s Bowie is not as solid as the other lines on this wall, the route involves the least shenanigans to approach, with a good 30+ meters of continuous climbing. 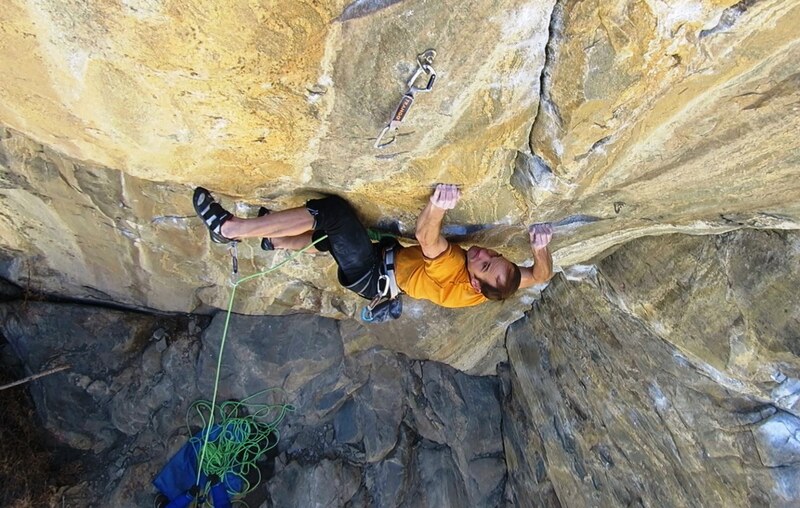 The first ascent of David’s Bowie, 5.13c, turning the roof on big jugs. 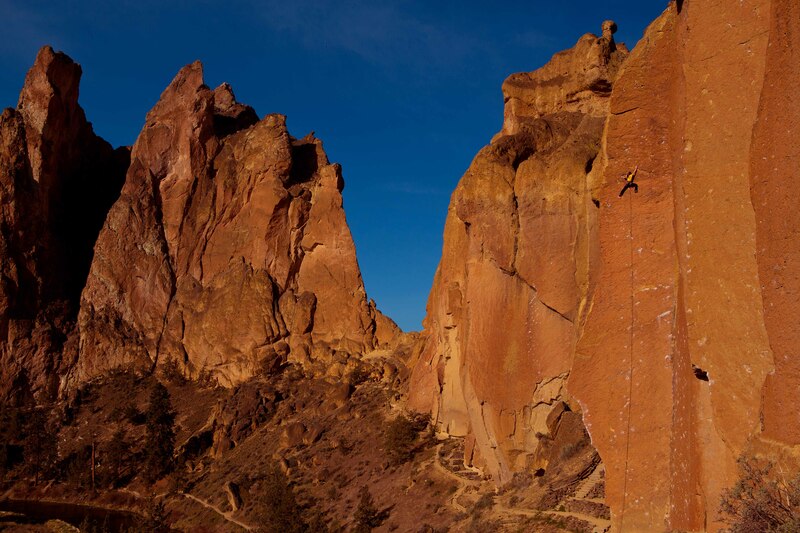 Though not as broad, this wall reminds me of Smith Rock’s Aggro Wall—a great hang, slightly overhanging, with shade that lasts till about 1 or 2pm, some minor slab shenanigans at the base, a few patches of choss here and there, but generally stacked with great hard lines (and a few silly linkups). 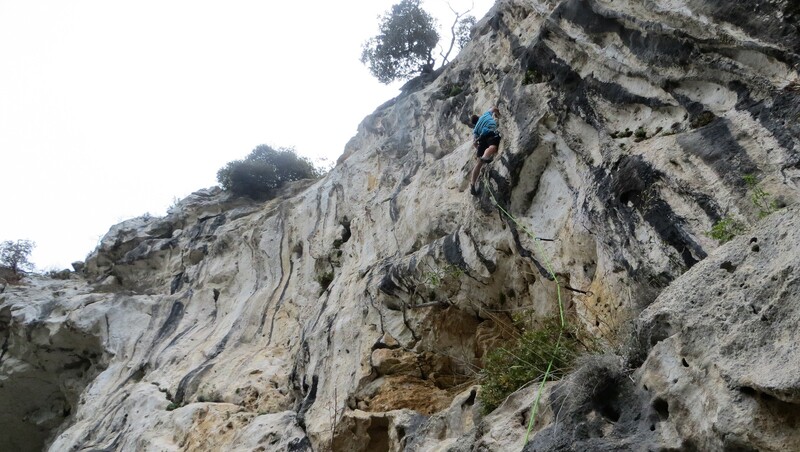 The routes go forever, but are set up to allow climbing in a single pitch with a 70-meter rope (though a double-lower is required for Sliced & Diced, Stiletto and Ultra Runner). 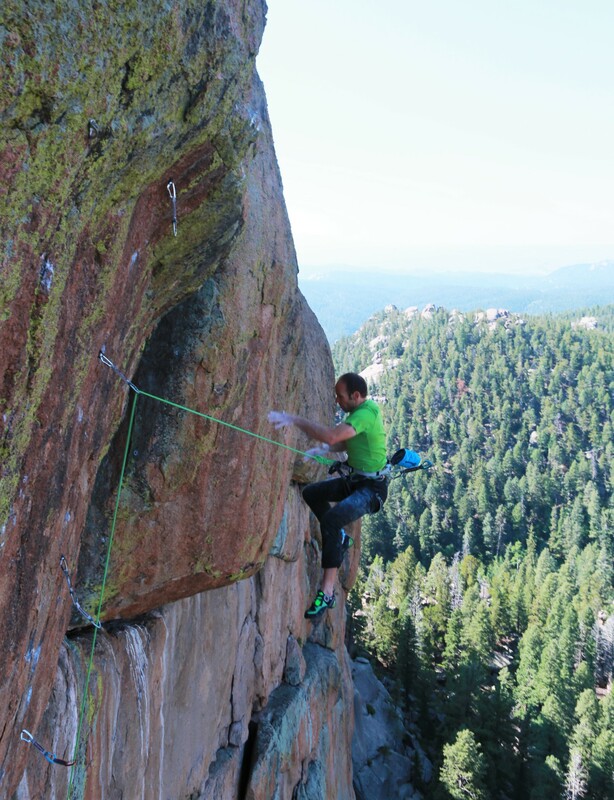 It’s a great venue for hard summer sport climbing for those who are tired of the I-70 parking lot. 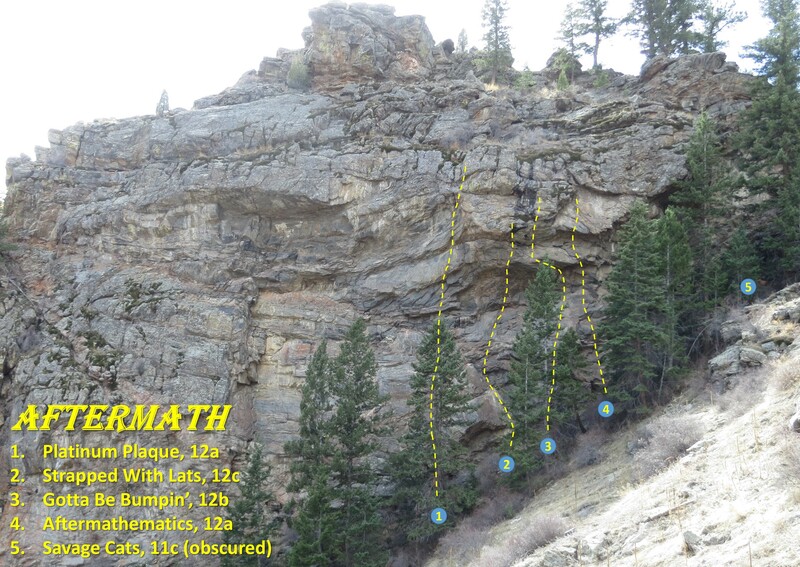 To get complete beta on the Switchblade, including approach details, topos, and descriptions of the 60-some other routes from 5.7-5.12d within a 5-minute walk, check out Tod’s guidebook on Rakkup. 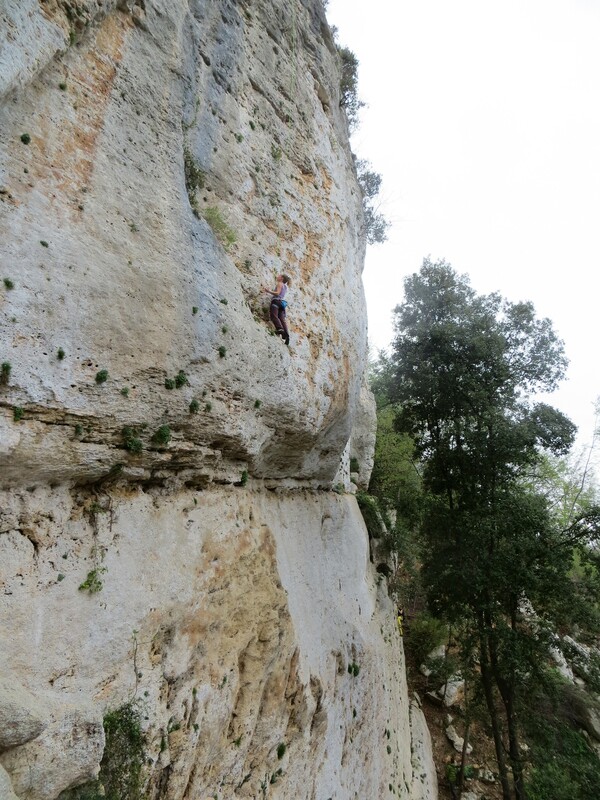 Nearing the top of Vole, 7b, at the French Limestone crag of Venasque. Photo Logan Anderson. Venasque is a little known crag outside the village of the same name, about an hour south of Buis. 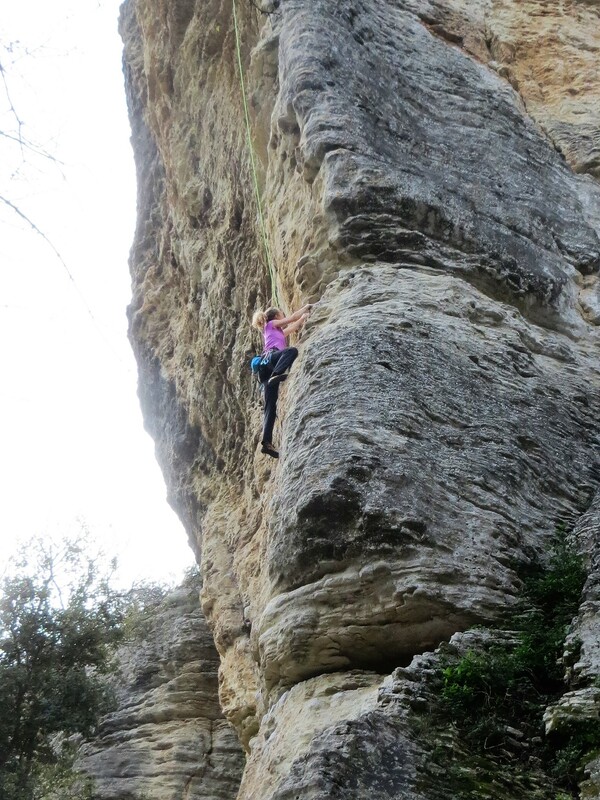 We first went there on one of my rest days, to give Kate a chance to climb some of the highly recommended 5.10s and 11s. 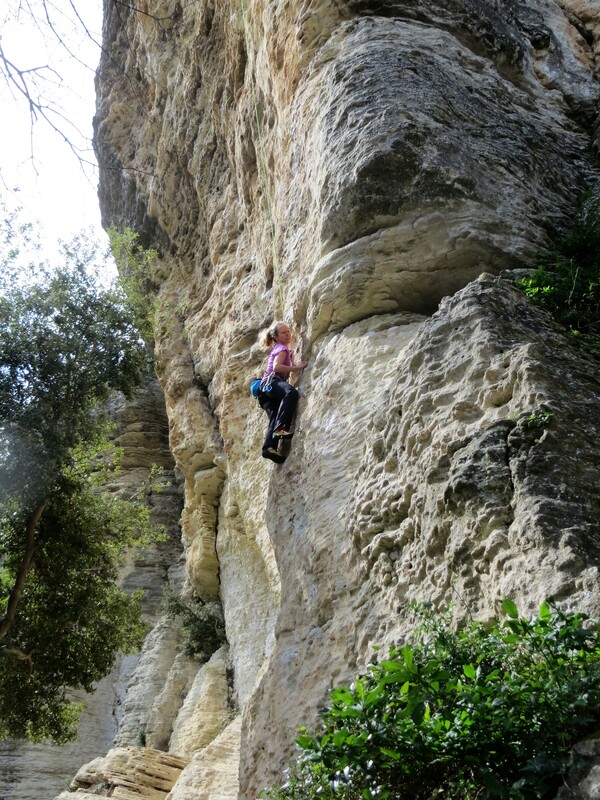 Kate really enjoyed the climbing, and it looked so fun that we both agreed we should return for our last day in France. 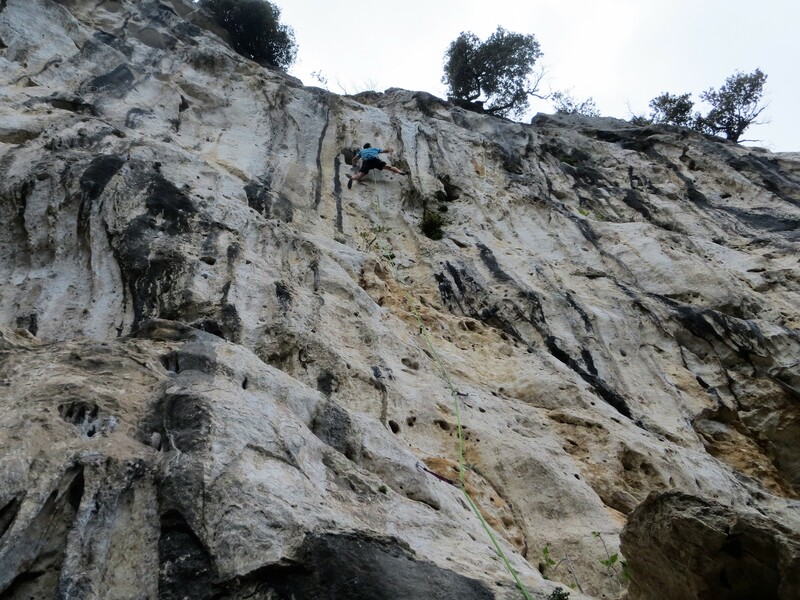 Kate cruising Beaucoup de Bruit Pour Rien (“A Lot of Noise for Nothing”), 6a+, on our first day at Venasque. The cliffs of Venasque don’t look remarkable (relative to other crags of the area). 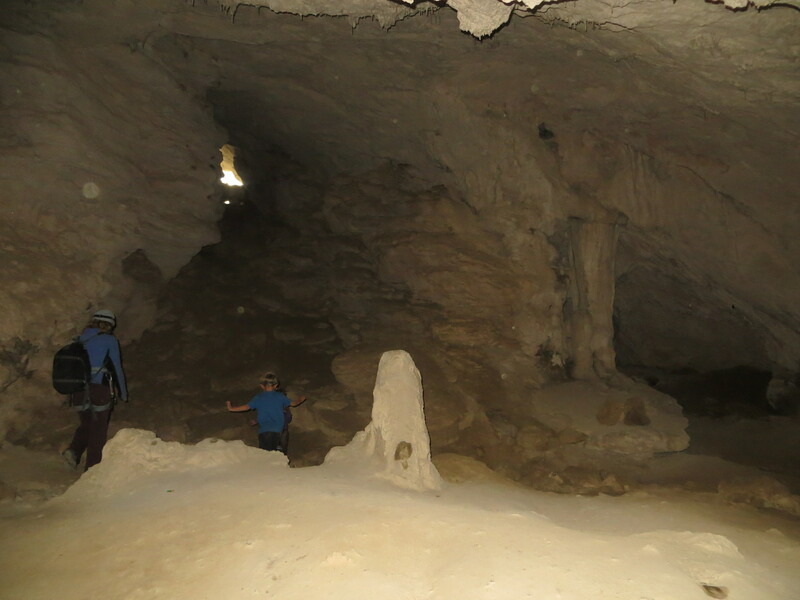 There are no tufas, the colors are bland relative to the orange and blue streaks of St Leger and Baume Rousse, and the scenery isn’t particularly special. But man, the climbing sure is fun! 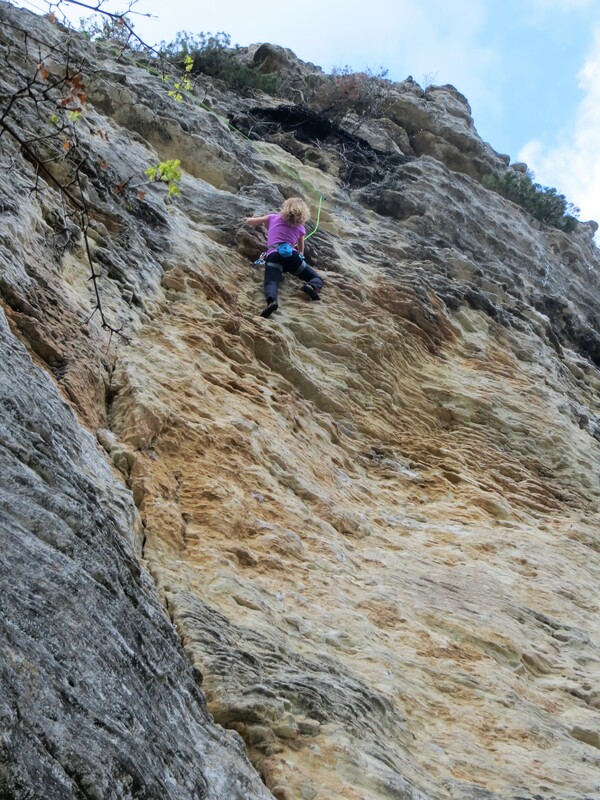 The rock is limestone, but it seems to have quite a bit of sandstone mixed in, and it’s weathered in a manner very similar to the best routes at Kentucky’s Red River Gorge. We spent most of our time at “Place de l’Ascle,” the main feature of which is a 30m wall, overhanging up to about 20 degrees, and covered in huge jugs. All the routes on this wall were spectacular 5.12 pumpfests. 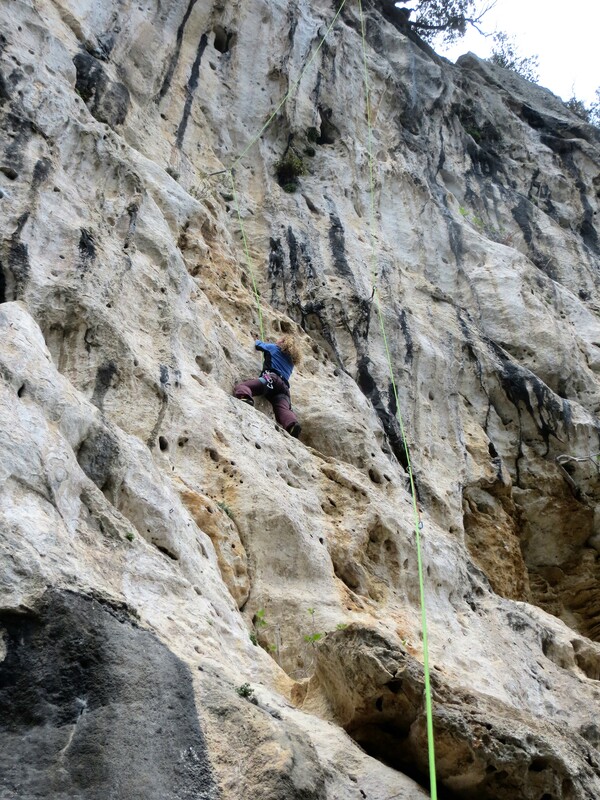 The routes aren’t particularly striking or cerebral, but it was definitely the most fun I had climbing on our trip. Kate starting up Petite Marie, a gobsmacking 5.11c that charges up the right side of a towering swell of overhanging jugs. 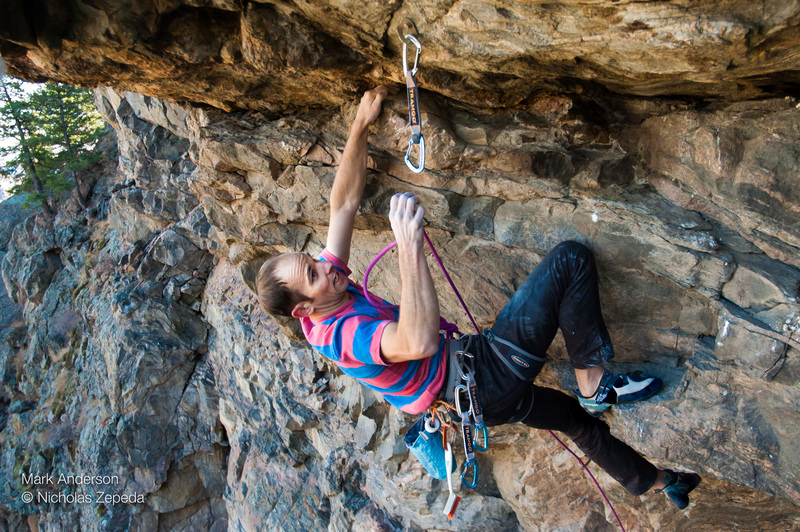 5.11 sport climbs don’t get any better than this. Higher on Petite Marie. 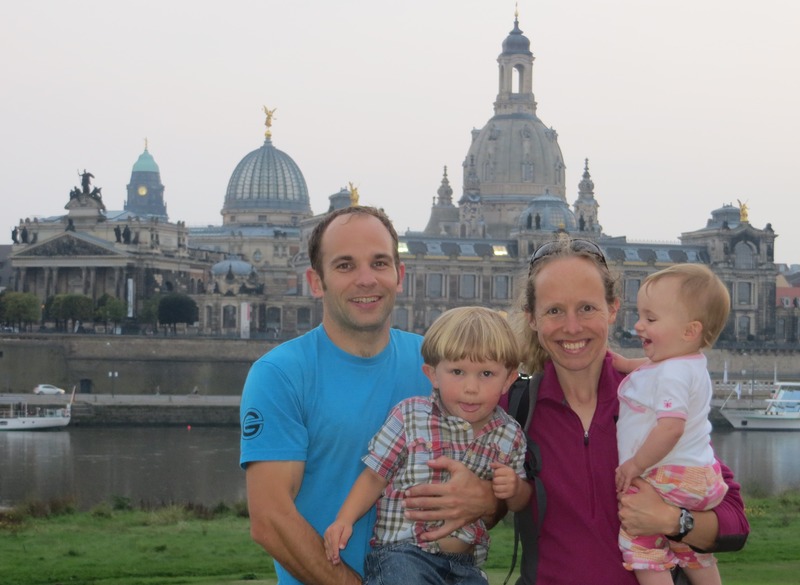 Note the leaning wave of rock to Kate’s left—home to Misanthropies Therapeutiques, Aller Plus Haute, and Vole. 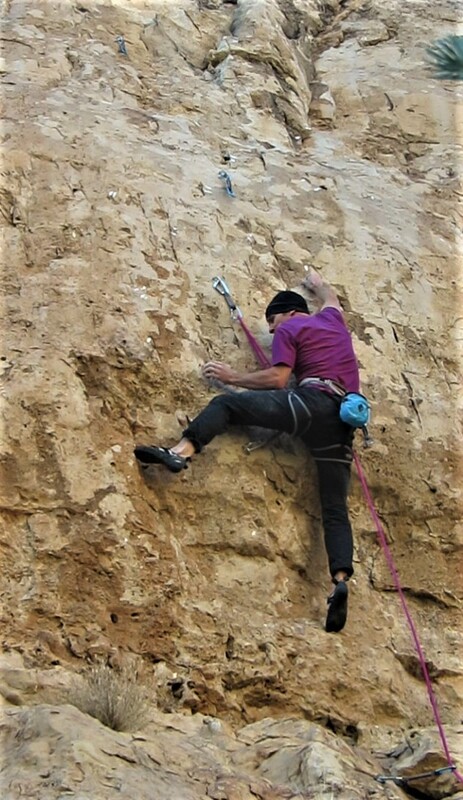 I started by warming up on a brilliant 7b on this wall called Misanthropies Therapeutiques, which was completely stellar, getting gently steeper, with equally growing holds, as you ascend (all the routes on this wall were like that). It was one of the most fun sport climbs I’ve ever done. 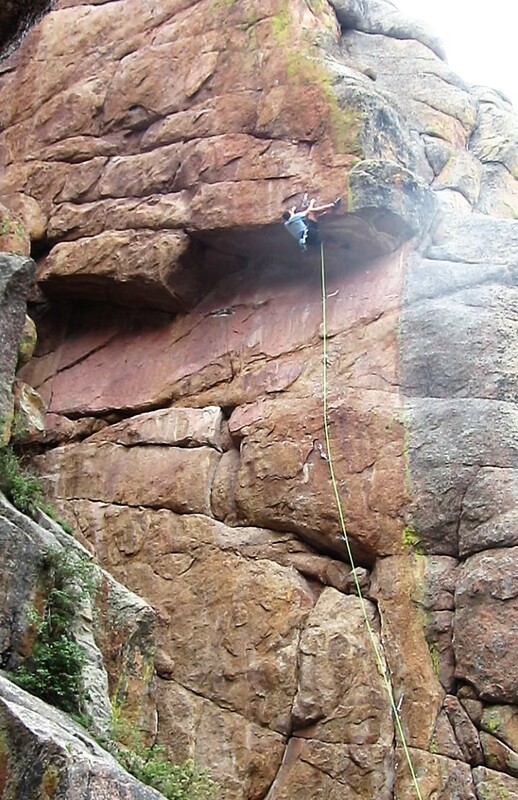 Next we moved to another sector along the same cliffband which the Rockfax guide described as a “must see wall that is the epitome of a sport crag and a must climb venue.” This cliff overhangs about 20 degrees, with a number of pockety, sequential lines from 7c-8b. 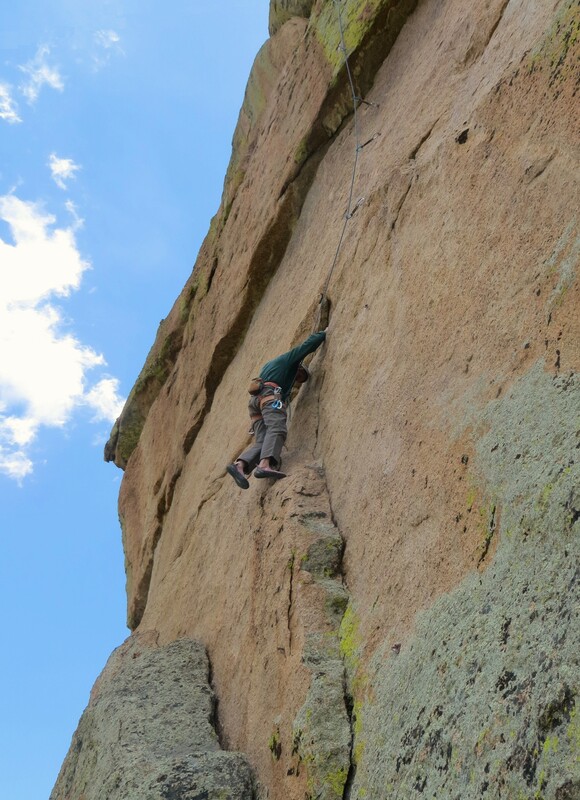 I tried a route called Objectif Puree, or “Pure Objective.” This name was apparently ironic, as I soon discovered about half the handholds on the route were chipped. It was a drag, and really turned me off on the wall. I felt like I was climbing in a gym with poor route-setting. It was also rather disappointing that some people think chipped garbage is “the epitome of a sport crag.” Whether that’s a reflection on the author’s taste, or the reputation of sport climbing (or both), I don’t know. Nor am I sure which would be worse. To me it seemed like a real waste of a cliff, not to mention a waste of a climbing day in Europe. Objectif Puree. Photo Amelie Anderson. 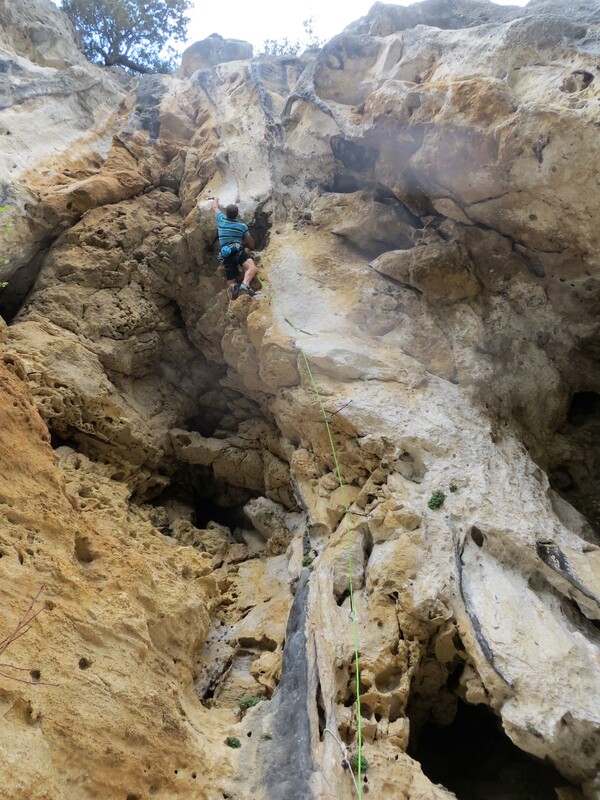 The upside of this revelation was that I was free to return to the first cliff and climb as many of the rad jughauls as my family could tolerate (fortunately it was also another great place to rig a rope swing, which got me at least one extra route beyond the usual quota). Midway up Vole, 7b. Misanthropies Therapeutiques is the next route left (following the flake system), and Aller Plus Haute is the second route left. Photo Logan Anderson. 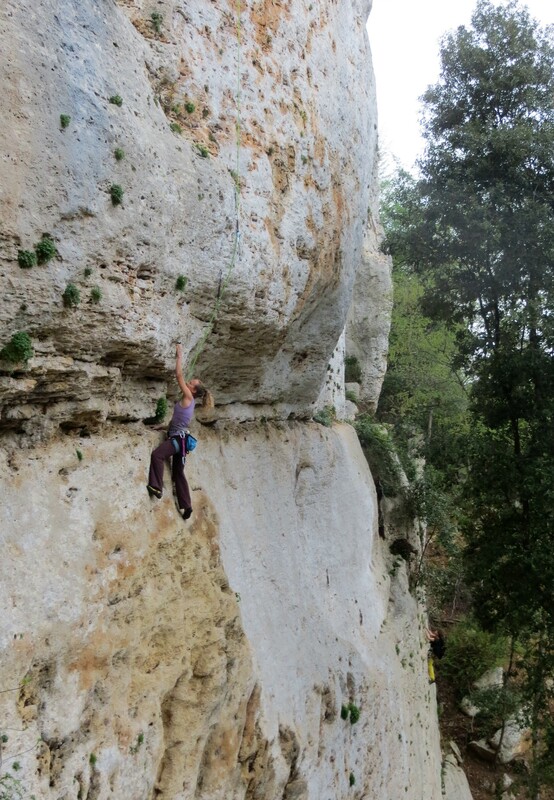 The most memorable moment of the day came as I was cleaning the 7b+ Aller Plus Haute (“Go High”). The crag is right over the road, at the intersection of a very popular hiking trail. A crowd of about 30 hikers came through, pausing briefly to watch my acrobatics as I neared the bottom quickdraw. When I cleaned this last draw on the steeply overhanging wall, I predictably swung way out over the road, greeted by a chorus of “oohs” and “aahs” from the gathered spectators. Logan getting in on the fun. All told it was easily my favorite day of climbing on the trip. The crag doesn’t look spectacular, it’s not photogenic or historic, but it’s hard not to have fun on these amazing cliffs. 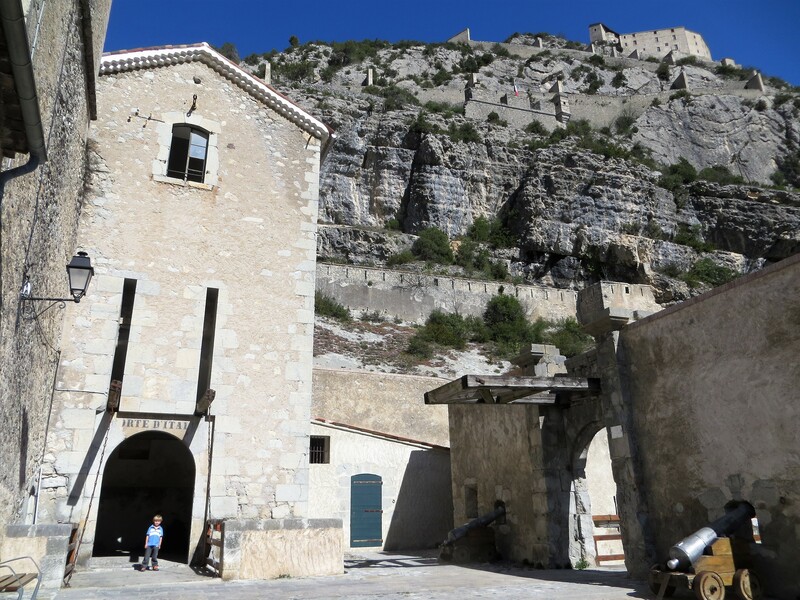 It was a great hang for the kids, with no approach, and nestled in one of the most scenic rural regions of Provence. It’s the perfect family vacation crag. 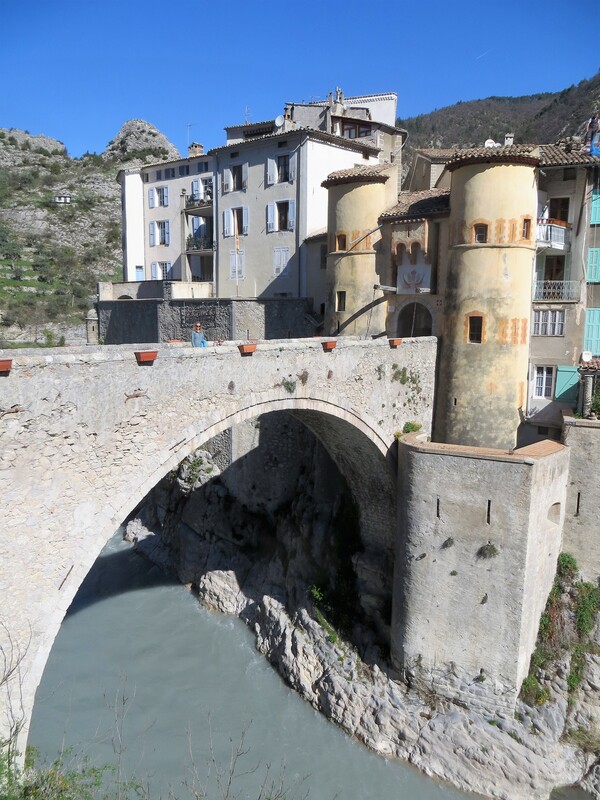 Castle of the Day – Entrevaux. 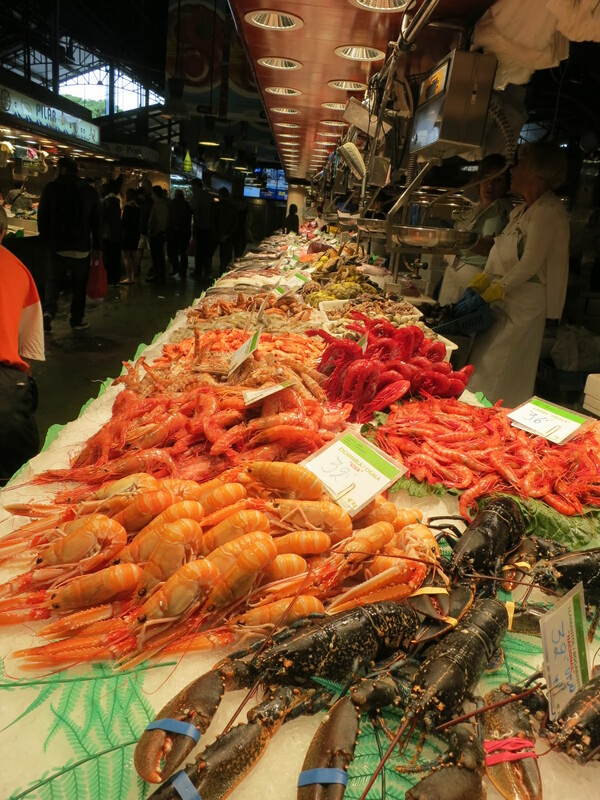 This one was so spectacular it gets two pics…. Logan had a great time playing with the two cannons at lower right. Note also the Citadel high above, and the zig-zagging path that climbs up to it. 8. Be A Maverick,—If you want to be as good as everyone else, do what everyone else does. If you want to be better than that, you have to do something different. 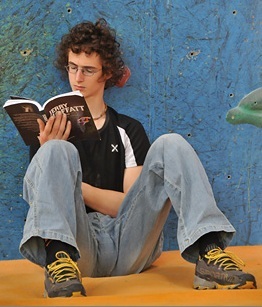 For literally years, I was the only climber in my gym who used a hangboard (and everyone looked at me funny). Fall 2016 probably would have won the title “Best Season Ever” even if it ended after the third day (the day I finished off my year-long bout with Shadowboxing). After that send I spent a night celebrating, which for me entails eating a bunch of food I normally wouldn’t, in this case a greasy double cheeseburger, fries, chocolate shake, onion rings, several donuts…(you get the idea). High on my new jughaul Aftermathematics, 5.12a, at Aftermath. Photo Nicholas Zepeda. Normally after a big send, and especially after a landmark send such as that one, I’m content to quit for the season, or at least dial back the intensity significantly. Actually, I often find it very difficult to climb at a high level successfully in the aftermath of a big send. This is most likely because it’s hard to mentally re-engage with another challenging goal after experiencing the euphoria, relief, and letdown of completing a major goal. But I had trained incredibly hard for this season, in anticipation of another extended battle. To give up my hard earned fitness and slim physique after only three climbing days seemed foolish. So while I was itching to let myself go, scarf up my “9a Cookie” in one sitting and follow it up with a dozen Krispy Kremes, I felt like I owed it to myself to at least try to eke a few more results out of my new climbing level. Thanks to my late-2015 bolting frenzy I had a long list of potential projects to choose from. 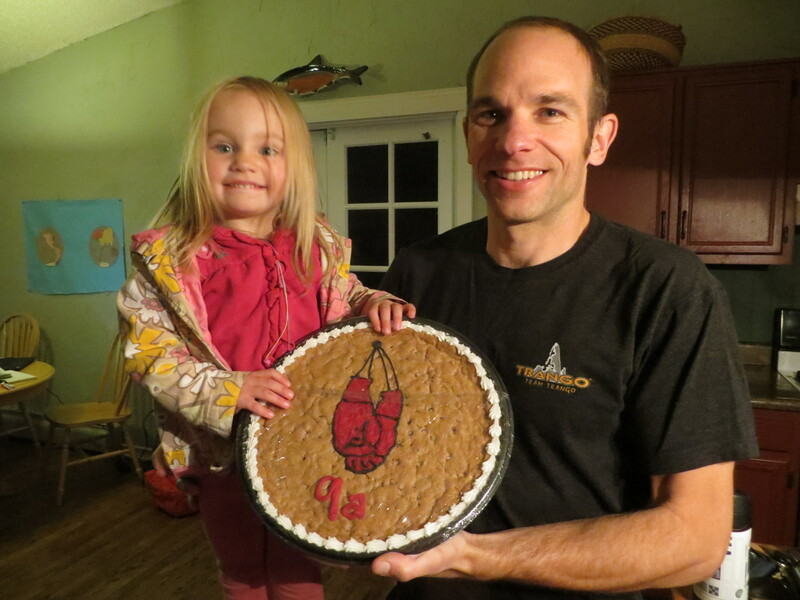 About a week after sending Shadowboxing, this “9a Cookie” (complete with boxing gloves) showed up at my house, courtesy of my friends at Trango. 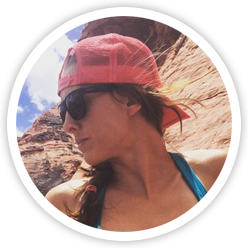 Trango has meant a lot more to me than just free gear, and I really could not have made it to this level without their support and motivation. One such line is perched high on Clear Creek’s Wall of the 90s. When I was working the twin roof-climbs Harlot and Hellcat, I was regularly distracted by an attractive swath of molasses stone heading up the extreme left end of the large roof system on the north end of the cliff. This looked to be the “last great roof problem” at the Wall of the 90s (which was already home to four roof routes in the 13d -14b range). I imagined the line would climb easily out to the lip of the roof along an incut flake, and then follow a series of small crimps up the slightly overhanging headwall. I bolted the line in November 2015, as soon as I heard that new bolting restrictions would go into effect for 2016. As steep lines go, it was impossible to inspect the rock in the roof without bolting my way down to it. When I arrived at the roof I found the flake I was counting on to support my body-weight was barely stable enough to support itself. Once it was cleaned, there was no clear path out the roof. But, since I had already bolted 90% of the route, I decided I might as well finish the bolt job and hope I could find another free sequence. Attemptiong the Wall of the 90s’ “last great roof problem,” which climbs out to the swath of dark brown stone ten feet left of Harlot. Photo Mark Dixon. So I wasn’t exactly optimistic when I returned to investigate the possibilities. I climbed up into the roof, and spent about 30 minutes dangling and groping for options. When I arrived back on the ground, convinced the line would not go, I started brainstorming ways to salvage the rest of the day. 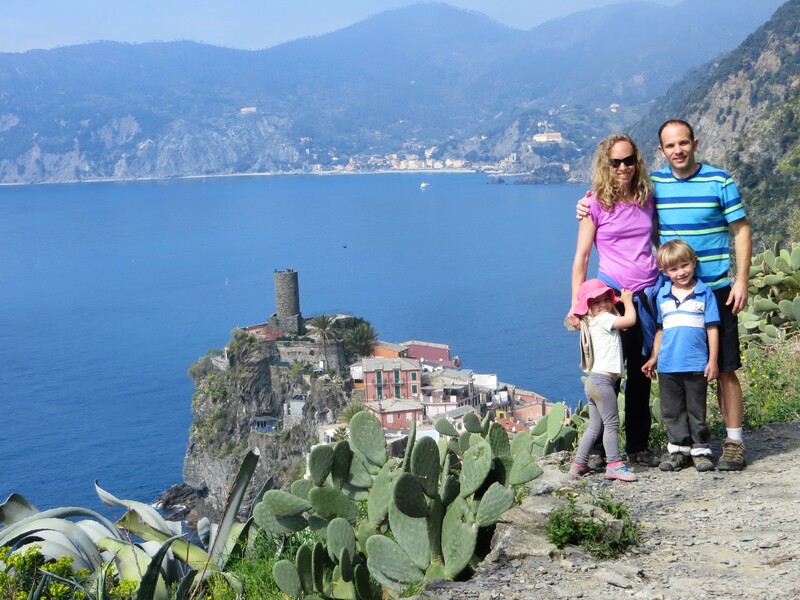 Perhaps I could try to onsight something, or try another open project at a nearby cliff…. Kate’s much more logical in these situations. She realizes if I were to bail after one go, I’d just end up dragging her back out there another day to try it again. And she remembers the countless times I’d lowered off a route after one try, dismayed and convinced it would not go, only to discover the solution on my second time up (in fact, that happened once on this very cliff, during my first day on Double Stout). Unable to deny her wisdom, I headed back up one more time. Of course, the second time I found hope. I wasn’t able to do all the moves, but I could imagine how they would go, and figured I would be able to do them. The remains of the loose flake offered a couple decent underclings, from which I could make a huge reach to a sloping, 1-pad, three-finger edge just over the lip. The problem with such a reach is that it leaves you over-extended, from which it’s hard to do much of anything, but with the right toe-hooking and core tension I figured I could match near the lip, and then theoretically dyno higher to another good edge. Reaching up to undercling the remains of the big flake. After matching the undercling, you have to make a huge reach to a 3-finger edge along the crescent shaped rail near the bottom of the lime streak. Two weeks later I made it back to the project, and this time I did the move. Once out of about 10 tries. Not super encouraging, but at least I knew now that I could do it, eventually. 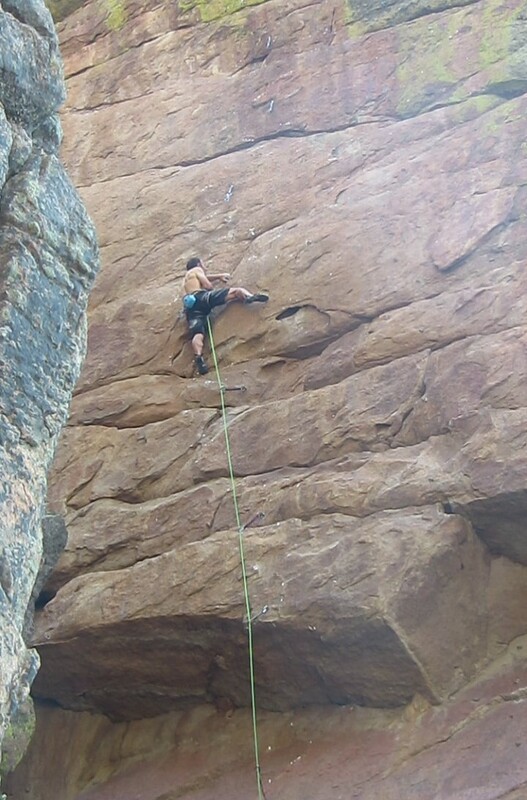 The rest of the route was getting much easier, and at least the crux was only a few moves in. I wasn’t able to return again until the end of October, and so I assumed I wouldn’t have the power to do the crux anymore, but I wanted to find out for sure before moving on to less bouldery projects. My first go of the day I managed to stick the crux dyno after only a couple of tries. 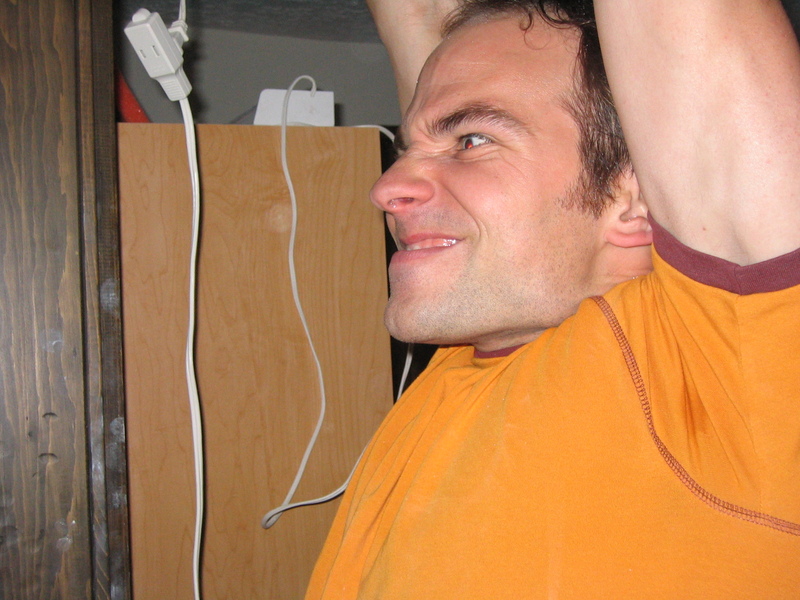 Anytime you’re throwing and catching all your body weight on small holds, there’s a chance of destroying your skin. I think when I had tried the move earlier in the season, I was reluctant to really commit 100% to latching the target hold, for fear of wrecking my skin. But now, nearing the end of a long season, I had little to lose, and found myself squeezing much harder on the latch. After a short break I roped up again. I had more trouble than usual getting to the lip of the roof. These moves require my maximum strength, and doing them even a few times can take quite a bit out of me. I had to lunge the last few inches to the three-finger edge, a move I did statically on my first go. As I worked my feet into position for the throw, I could feel my hand slowing opening up on the three-finger edge. “Now or never,” I thought, unleashing myself outward and upward over the lip. I nailed the hold and somehow controlled the violent recoil of my lower body. I threw a foot up, slapped up onto the hanging upper panel, and cruised up incut crimps to the anchor. 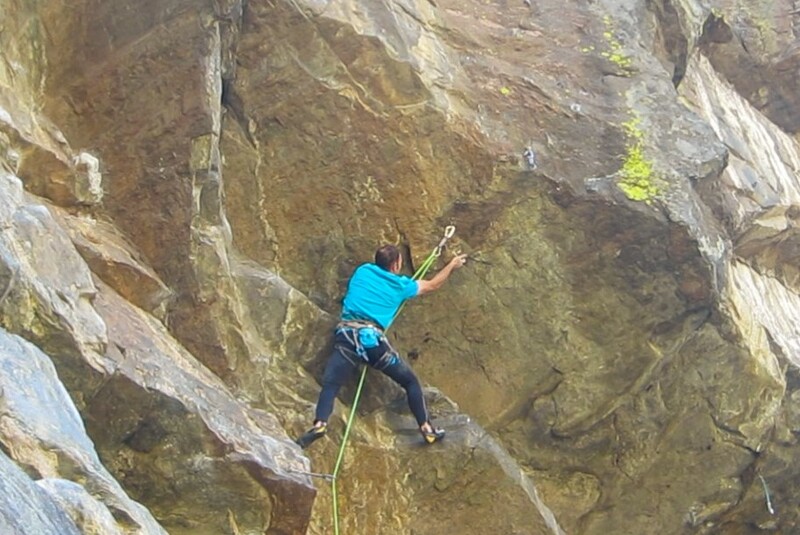 Cranking between incut crimps on the pumpy, slightly overhanging headwall. 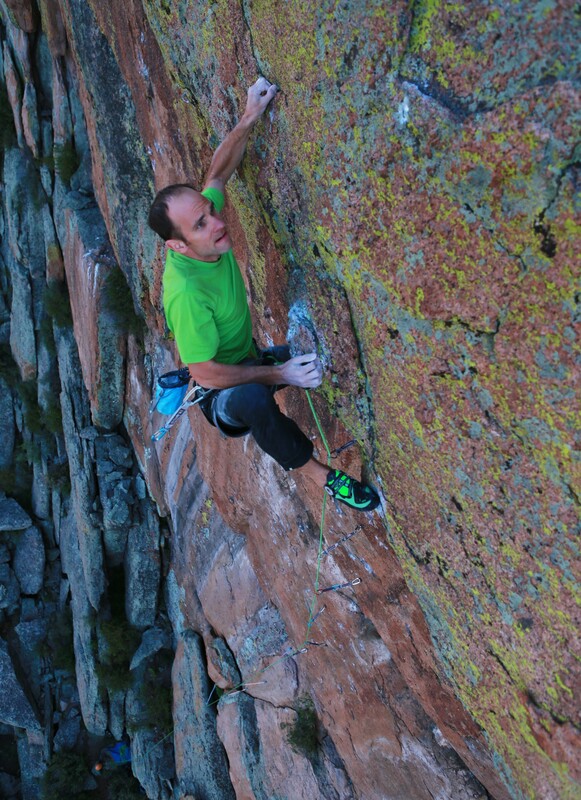 I named the route “Seven Minute Abs” for its core-intensive crux. 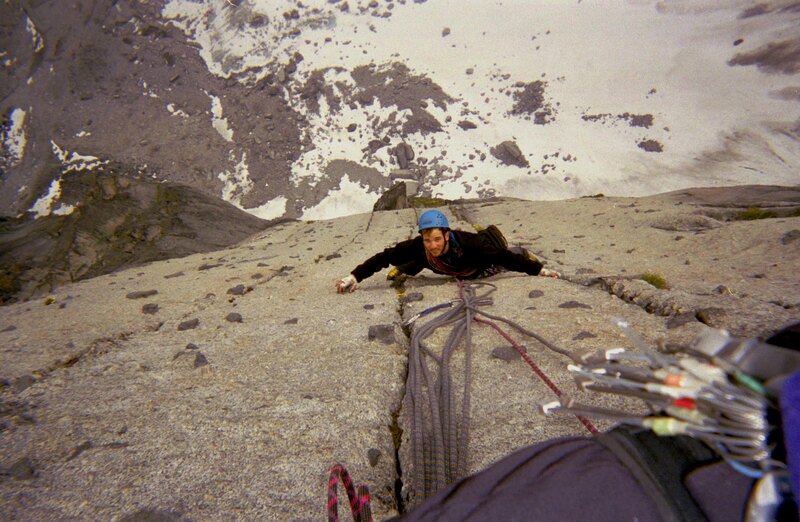 I reckon this is the hardest of my roof climb first ascents. The crux move is much harder than the crux move on any of my other roof routes, but the climbing is quite a bit less sustained than on the others. 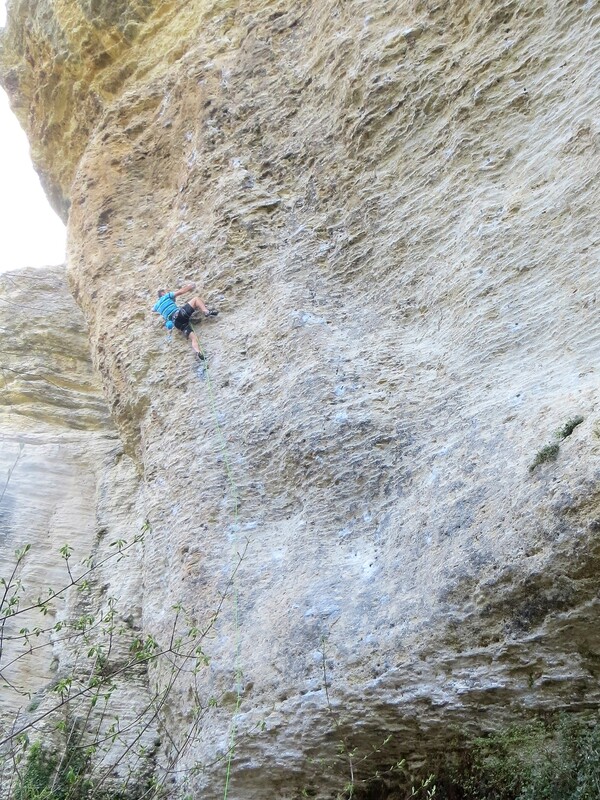 I put it at the low end of 5.14b, but with a relatively intense, reachy crux that makes for sketchy grading. I find it bizarrely ironic that I’ve evolved into a roof-climbing connoisseur. 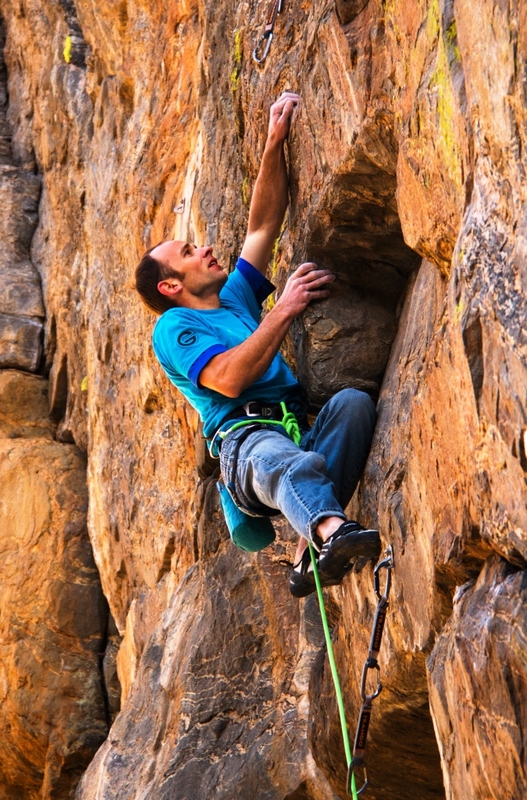 I really don’t care for that type of climbing at all, nor do I consider myself in the least bit good at it, but when you want to do new routes in a place that’s thoroughly picked over, you have to work with the rock that’s left over. Clearly nobody else likes hard roof climbing either, since so many “good” roof routes have been left for me to claim. I am grateful for that. With my hard projects wrapped up, I was free to try easier routes (and eat donuts). 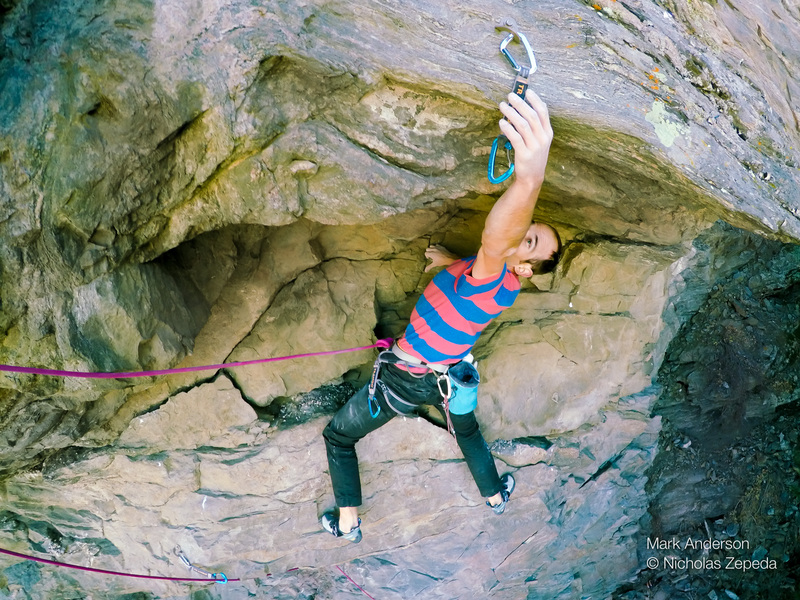 I was particularly psyched to check out some routes at a steeply overhanging wall in Clear Creek called Aftermath that I bolted in December 2015, but hadn’t yet had the chance to climb. Just after topping out the crux mantle of Aftermathematics, 5.12a. Photo Nicholas Zepeda. 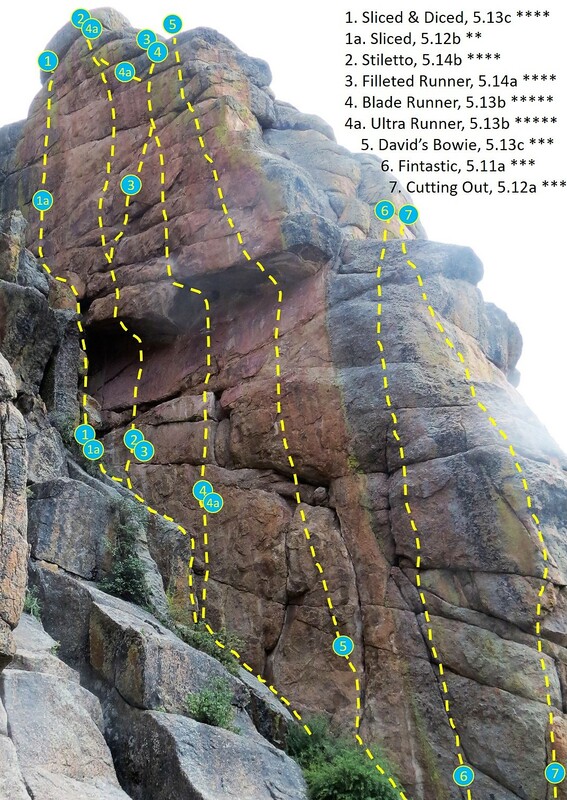 Certainly the crag won’t appeal to everyone, but those who don’t mind a bit of an adventure are in for some really fun, exposed climbs at relatively modest grades. 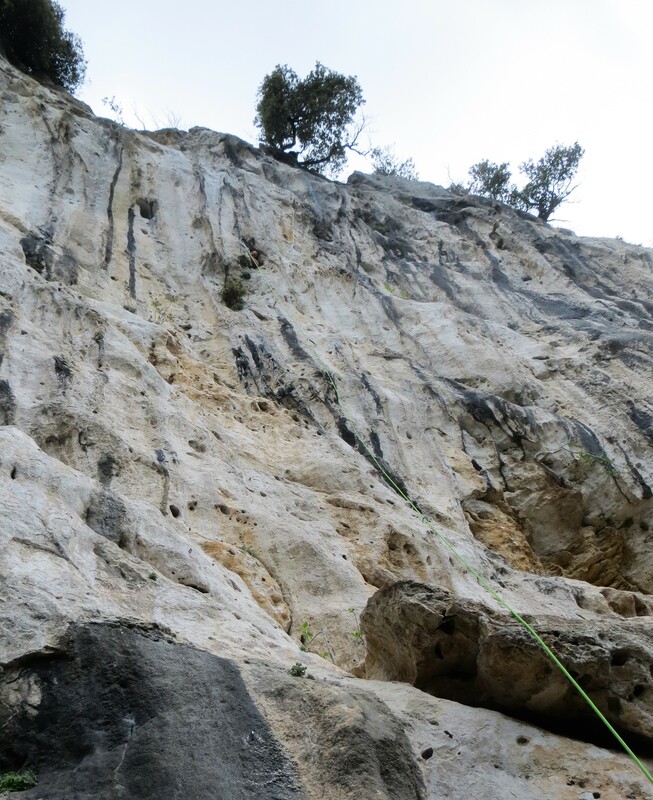 The crag has five lines, ranging from 5.11+ to 5.12+. 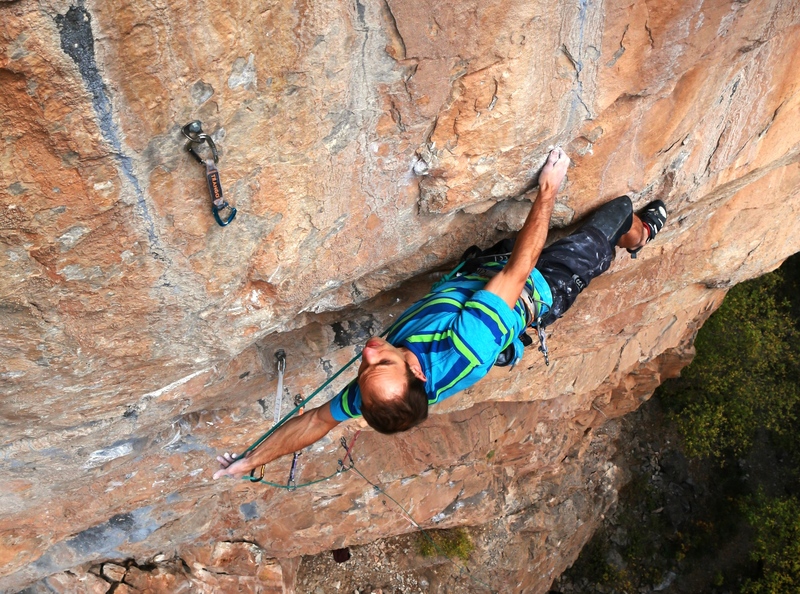 There are three routes climbing out the largest overhang, and all of these climb almost entirely on full-hand jugs. 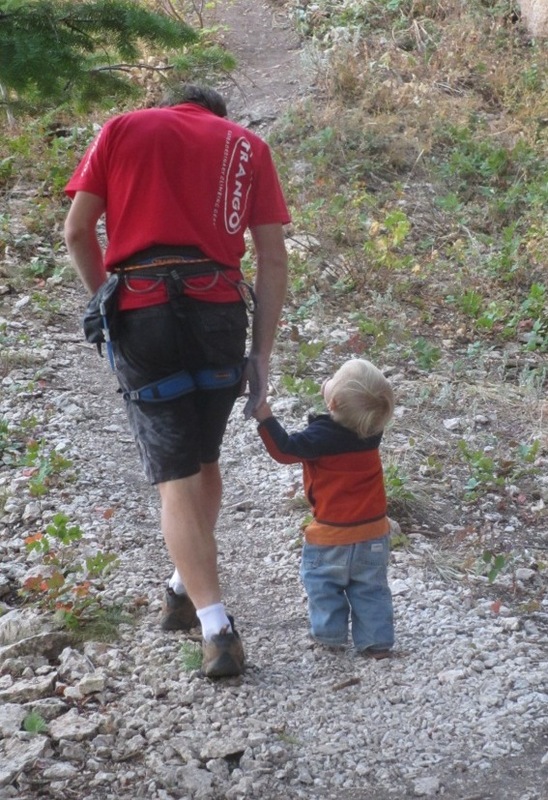 Boer and I thoroughly enjoyed the climbing, so much so that I climbed “Strapped with Lats” twice, just for fun. 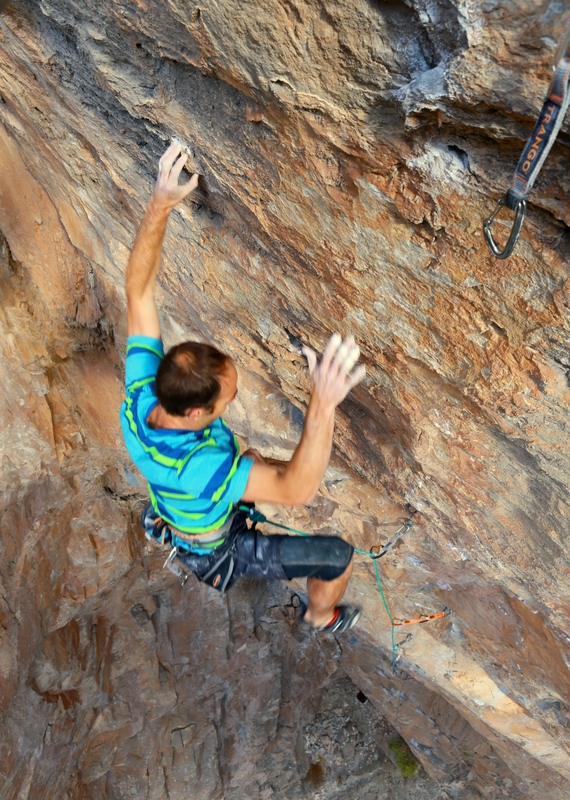 The first ascent of Strapped with Lats, 5.12c, at Aftermath. Photo Nicholas Zepeda. 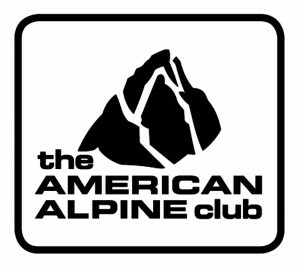 This was by far the most successful season of my climbing career. 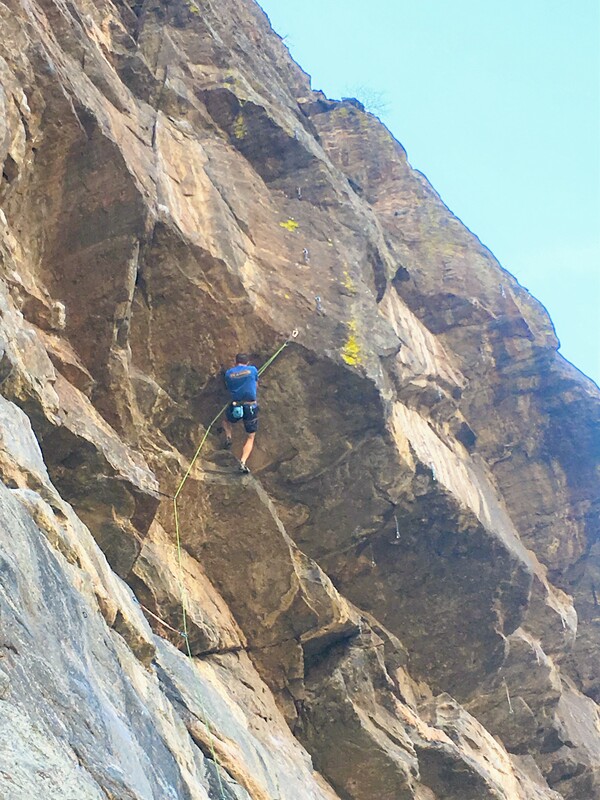 All told I sent my hardest route ever, and still had time and psych left over to complete more than ten first ascents between Clear Creek and Shelf Road (including two 14b’s, a 14a and three 5.13’s). For the first time in a couple years I found myself wanting to extend my climbing season rather than jump back in the barn to train for the next one. I’m a bit bummed it has to end, but I have plenty to get stoked (and strong) for this coming winter.